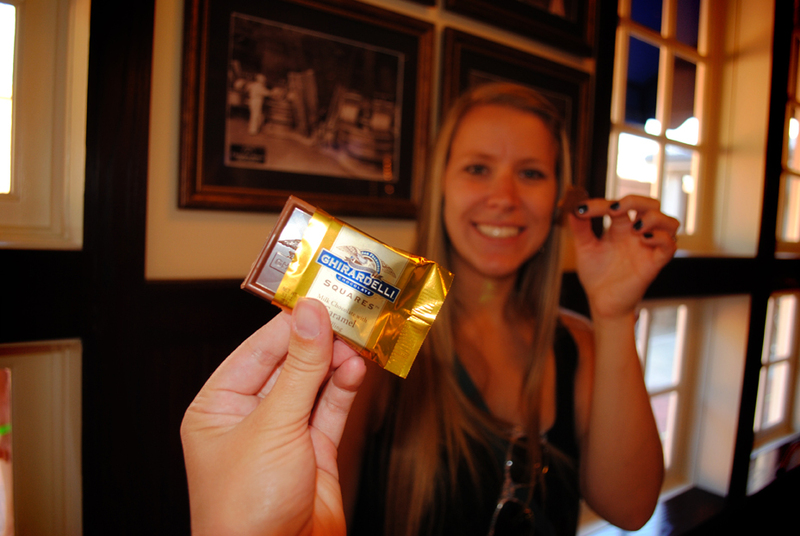 This past weekend I got to experience the Walt Disney Family Museum—finally! We made a trip up to San Francisco, just to make it in time to experience the Mary Blair exhibit at the museum. With only 2 hours in total to spend there, we started with Mary Blair as the thought was, the Walt Disney Family Museum will always be there and we can always come back. So that’s how I ended up spending a whole hour in Mary Blair world and had to rush through the Walt Disney Family Museum at lightning speed. Yes, rush, as there are 11 galleries to experience and each one is pretty big and unique! I really didn’t get to read much but just get the overall impression of each gallery and move on… but I still walked away feeling inspired by both Walt and Mary and charged up to get to work and to follow my own dreams that I am so passionate about. Between the two, my big take away was a continued encouragement to tackle your passion, your work, your dreams with your whole heart and give it all you got. Whether your passion is design and art or not, both Mary Blair and Walt Disney did not do anything halfway. Everything they did and everything they touched, was done 100%. If they ran into a problem, they researched, they dug deeper, they clung to it harder. They tried again and again and got it done. Beautifully and epically done. Sidenote—Before I go on, you may even be wondering who Mary Blair even is…. she was a conceptual artist for Disney. So she created a lot of the ideas and overall feelings for the animators to base their final drawings on for movies like Peter Pan (my fave! ), Alice in Wonderland, and Cinderella. 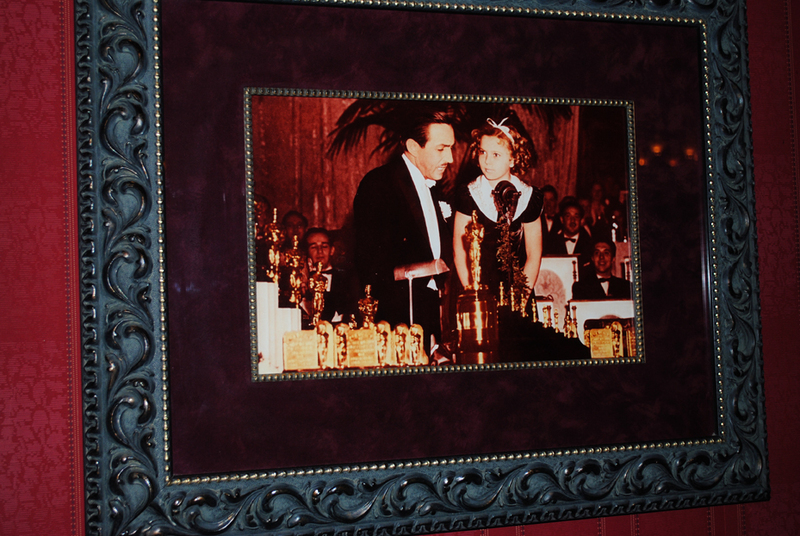 She then left Disney for a time, but then came back to work on the attraction its a small world for the World’s Fair. That ride then came back to make its home at Disneyland—and is one of the few rides that are actually in every single Disney park.—end very long sidenote. Recognize this scene from its a small world from Mary Blair’s sketchbook—her rough sketches are as bad as mine! 1. Take a vacation when you can. Even if its a working trip. Get out of your box and experience life. 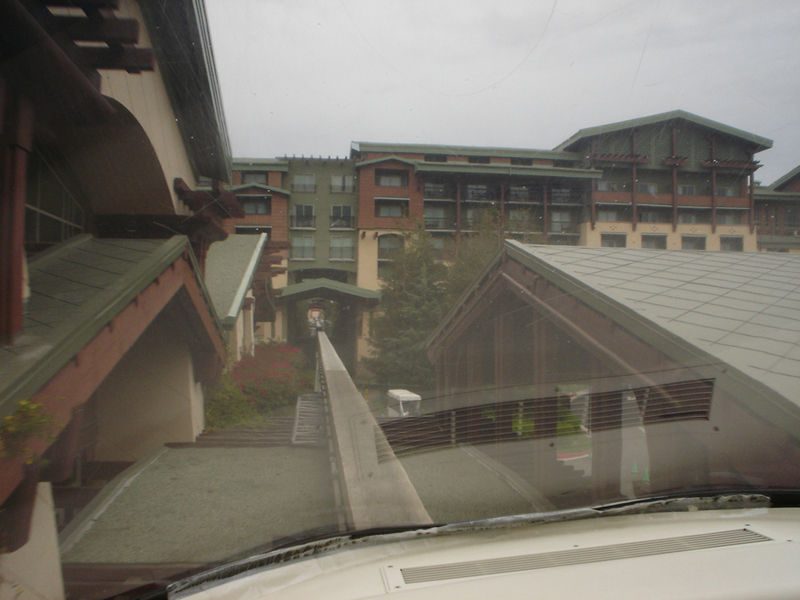 Similarly, I had encouraging take-aways from Walt Disney as well but on a much grander and different scale. 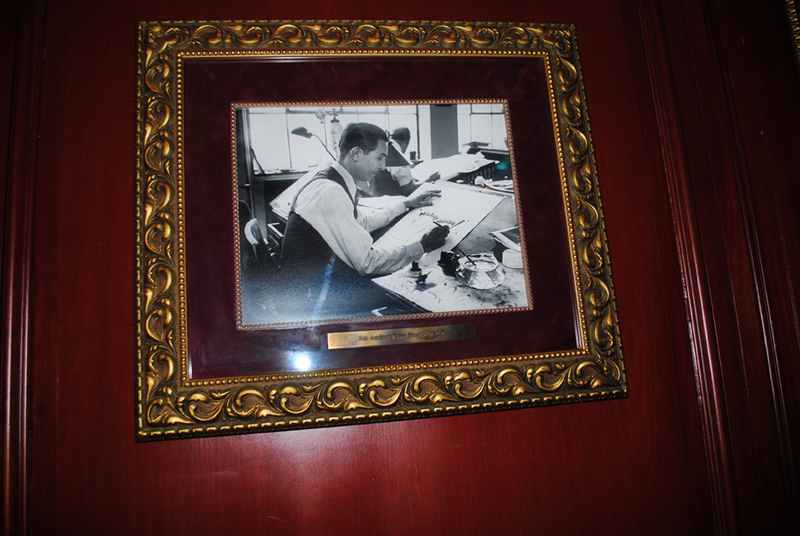 I love how Walt would come up with some crazy new idea, and without having a means to get the idea done, he would then create the tool to get it done. One example of that would be the multi plane camera that enables their animations to have that layered quality… from the foreground to the background. Okay, I’m getting rather technical now… so back to the feelings part…. Walt had a vision, he had a dream… he actually had a lot of visions and a lot of dreams… so he made these teams of like-minded people and together they accomplished world changing creative endeavors. 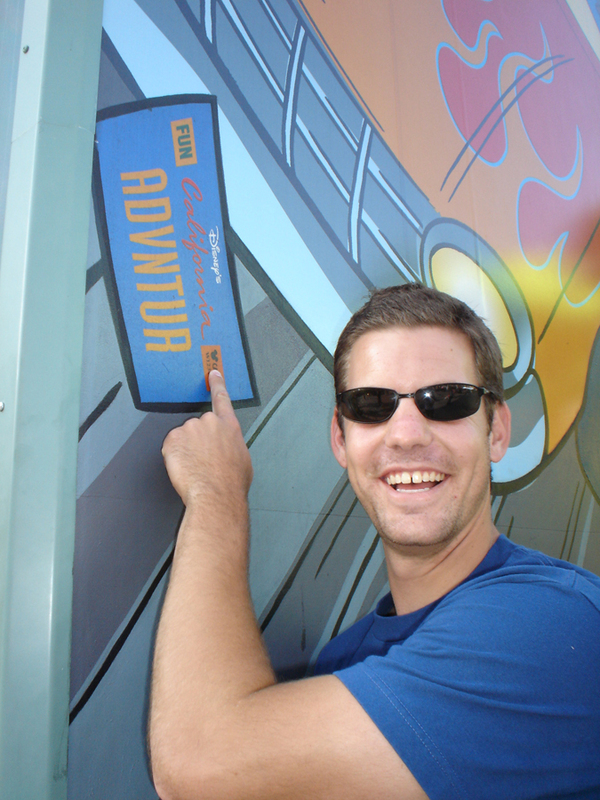 I think its amazing to see where he started… he taught himself how to draw, how to animate… and from that planted seed he grew a company and a brand that was then able to grow to such a giant scale of an amusement park. That road from A to B…. was marked with so many failures but then so many wins…. so many struggles and problems but then so many victories and solutions. A bench from the park where Disney was first inspired to create his own amusement park: Disneyland. 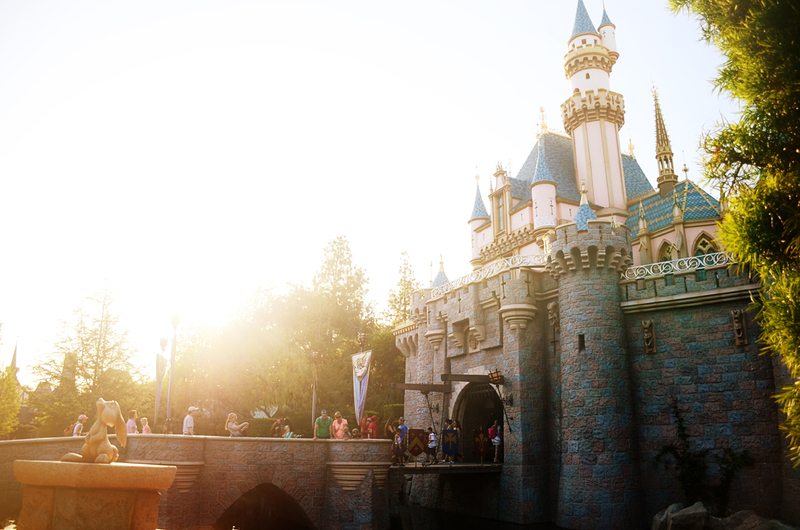 Of course, while I love the animation and film side of Disney, my heart truly is captured by Disneyland. The museum kinda lacked in this area. However, it did have a “massive” minitature model of Disneyland. 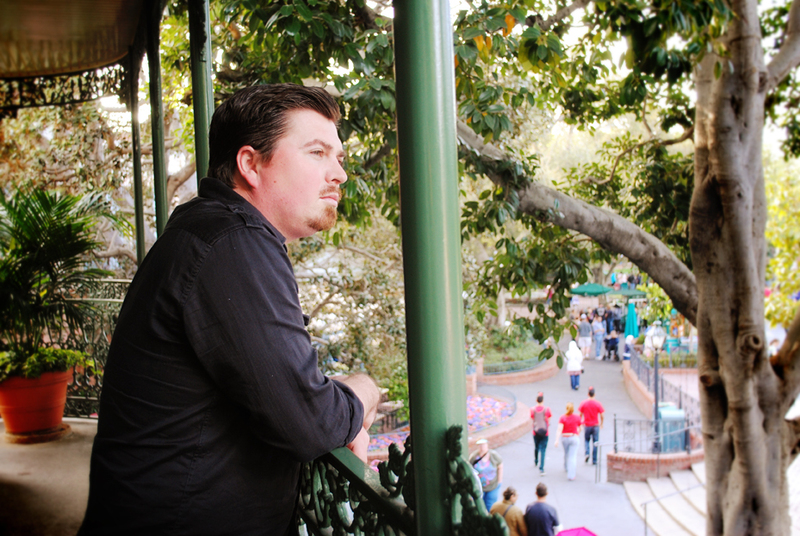 Not Disneyland of any certain year, but the Disneyland that Walt knew and loved. 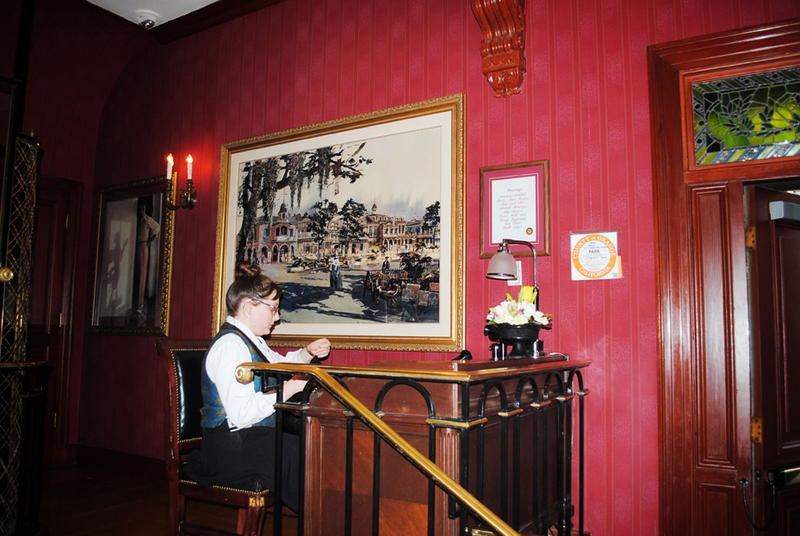 It showed all the rides that he had a hand in, whether or not they had opened before his death (like Haunted Mansion). To view this model, from above, was remarkable. To see the imagination it took to create this larger than life amusement park that was done in the quality it was down to the smallest detail. He left no stone unturned, seriously, even the ground slowly changes theme as you walk from land to land. Walt knew quality, and expected nothing less. The earliest known drawing of Mickey Mouse. Thank you Walt, for being such an inspiration to me… ever since I was a little girl, but more so since I grew up to be a big kid. A kid that wants to explore her creative boundaries and push the limits. To be inspired and to inspire. To have dreams and follow them through. A kid that wants to spark that light in others while continuing to burn my own creative juices. And to do everything I put my mind to with every ounce of strength I have. My favorite design posts are ones that go through the process of their creations. Kelli Anderson’s process is always so deep and unique per project. Her skills this time even expanded to architecture design as she got to work on the store front of the new Russ & Daughters cafe. Every piece designed for Russ & Daughters is beautiful standing alone, and then brought together they form a truly unique look that goes past the paper goods, through the interior design and to the store front. She even got a look at the creation of the neon sign outside! A dream project executed to perfection. It takes a long time to write process posts, but somehow Kelli makes it look effortless and I thank her for the time she spends on them. I finished the post truly inspired and hope to always apply that much effort to all my own projects. See the post here. P.S. I also am really craving a charcuterie platter now. 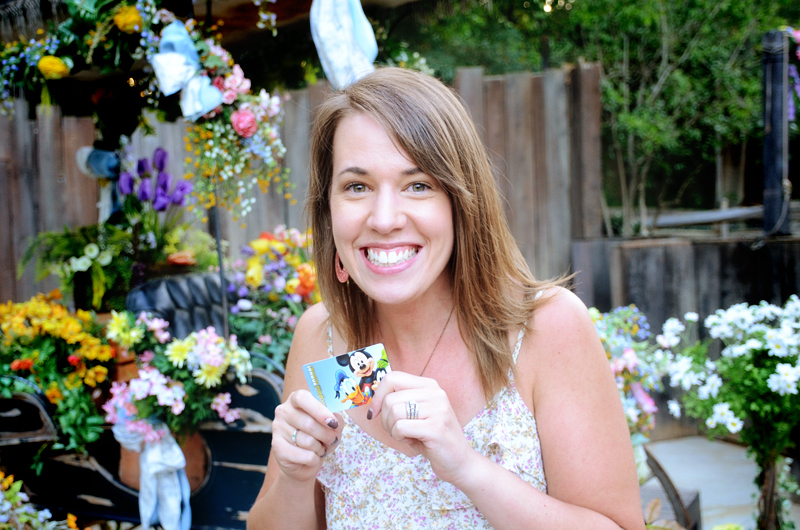 LOVE this fun new blog series, Pageant of the Masters; where floral designer Ashley Beyer of Tinge Floral, Kate Osborne of Kate Osborne Photography and Brittany from The House that Lars Built team up to recreate famous paintings that feature floral elements. They did such a perfect job and I love the bit of process they give behind the creations… like how in their latest piece, Herbert James Draper’s Pot Pourri, its not even physically possible to hold the bowl in such a way so in the photo someone is holding it from below the table. So interesting and so fun! Ever since our trip to New York City this past summer, I declared the Chrysler Building to be my favorite NYC building. Literally, every time I see it in movies now I nudge my hubby to acknowledge my new fave. So now I’m nudging you… check out the short and sweet post on Design*Sponge for a little history on this beautiful art deco building that has graced the NYC skyline since the 30’s. A few weeks ago, I saw a post on my new favorite illustrator, Joey Chou’s site, that he was releasing some new Disney related prints and work. And even though I am so very behind in reading my beloved blogs, I happened to see it just 2 days before he would be at Downtown Disney at a signing event. Since I’m collecting pieces for my Disneyland themed guest room, and was struggling to find a Haunted Mansion piece that wasn’t too gory but kept with my look, I fell immediately in love with his Haunted Mansion piece. Saturday came and we trekked down to the park, of course not going inside the park itself—very bitterwsweet, and got in line. Unfortunately, Joey was very late to the signing and we couldn’t wait for him to arrive but I did get my Haunted Mansion piece! Someday, hopefully, I’ll get it signed! 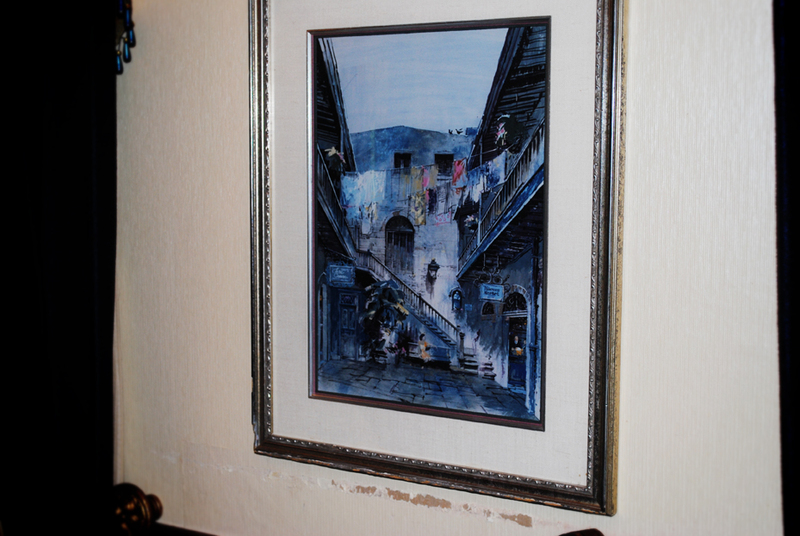 But until then… it will be hanging for all my guests to see! See more of Joey’s new Disney inspired pieces here. I’m really excited for this new blog series, Great Dates, on A Beautiful Mess!! Their creativity knows no bounds!! 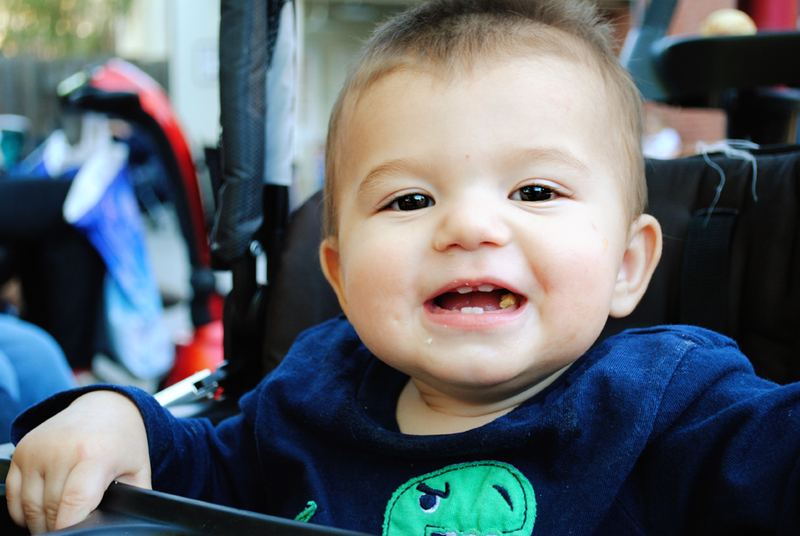 See the inaugural post where they enjoy a brunch date followed by a farmers market. Today my Disneyland pass expires. 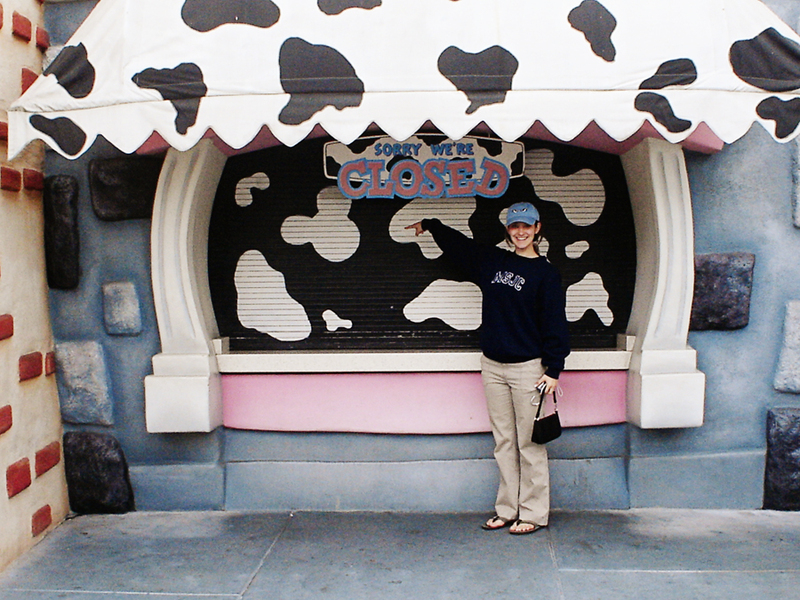 After having an annual pass to the Happiest Place on Earth since Christmas of 2004, I am so heartbroken to not just be able to head down there whenever I want. Looking back over the years, I feel so blessed and am so thankful for all the little moments and celebrating all the major milestones. It’s the place I fell in love, it’s where friendships were strenghtened, its the place where my little nieces and nephews saw a whole new world with a sparkle in their eyes. And oh my gosh, I miss it already. 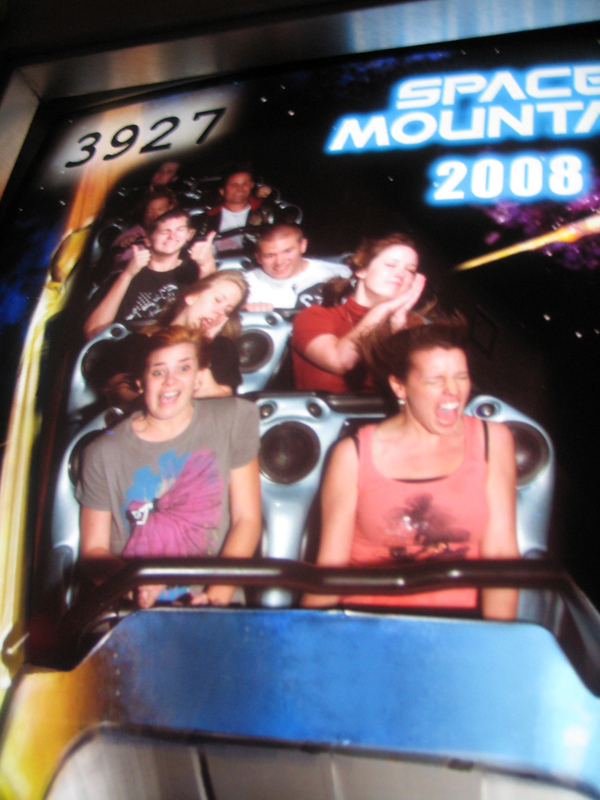 On the other hand, Disneyland to me has always been a creative and artistic masterpiece. 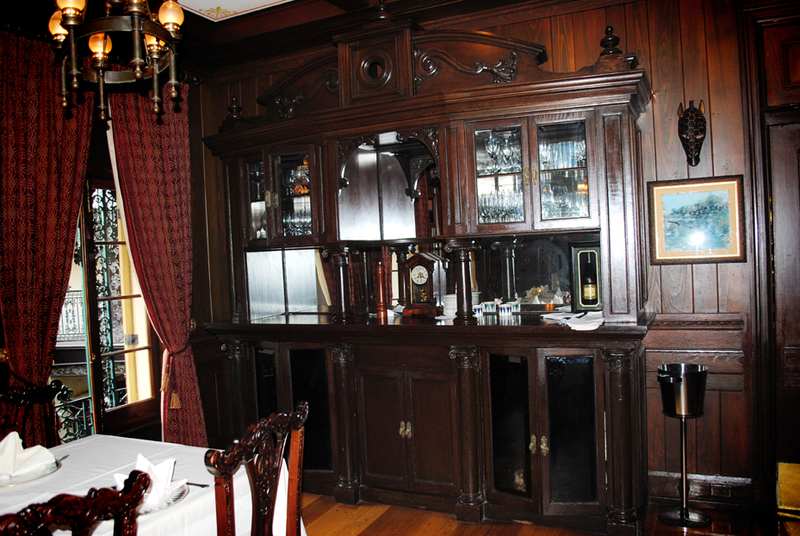 Every single nook and cranny has been thoughtfully executed down to the smallest detail. 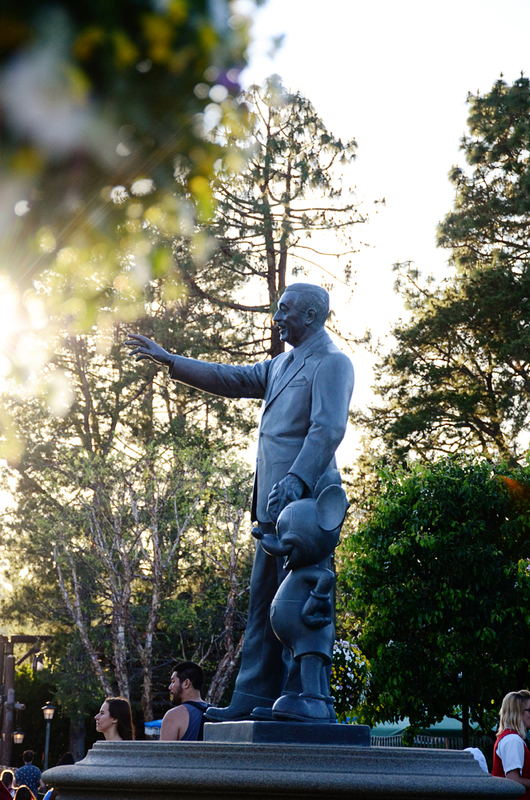 It has been crafted with love and a passion for the ideals of one man, Walt Disney. Walking down Main Street, I am just filled with so much creative juice that my heart just feels full and my mind is racing with ideas. And while I am taking a break from having a pass for awhile… I will forever cherish all these days and nights spent in the most beautiful amusement park ever created. Okay, I think Paris and Tokyo Disneyland are the prettiest, but I haven’t been to those—yet. So here’s to yet another great year spent at the Happiest Place on Earth—and my last for a little while! To the memories and photographs, to the friends and laughter. 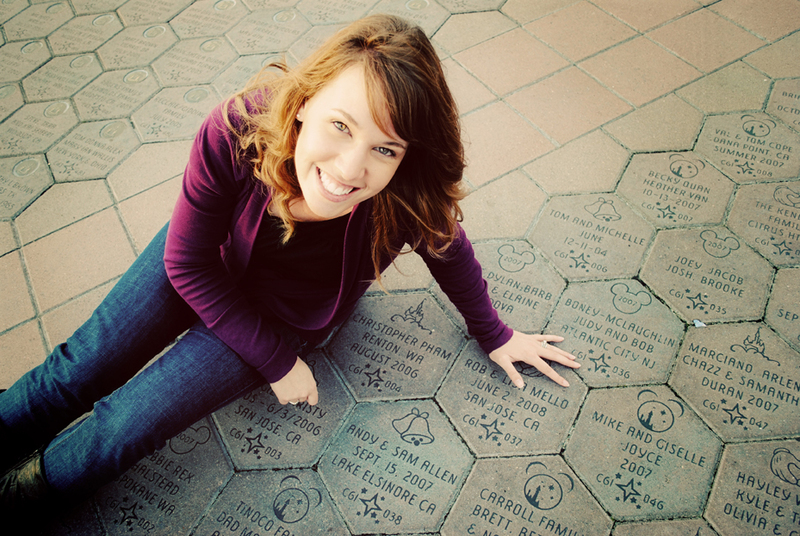 See my 2010 year at Disneyland, 2011, and 2012. 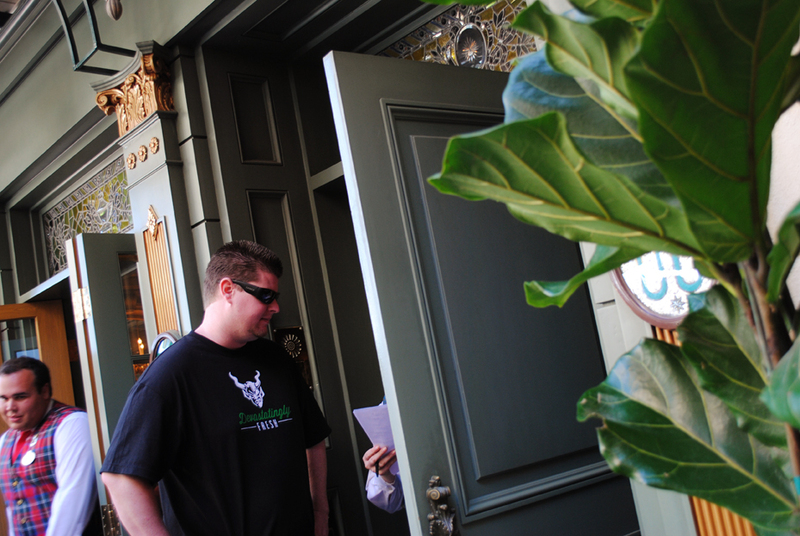 Saying goodbye to the Courtyard of Angels as they closed it down the following week to make it the new entrance to Club 33. 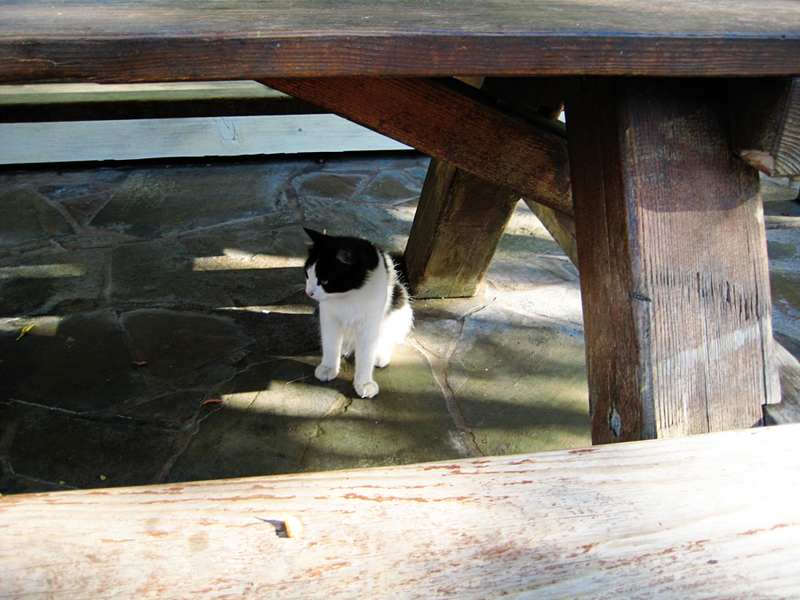 It’s my favorite spot in the park, see my post on it here. My first trip with my newest Disneyland ride buddy!! I was pretty excited, can you tell? First time seeing Amie as Mrs. Pankratz since the wedding! 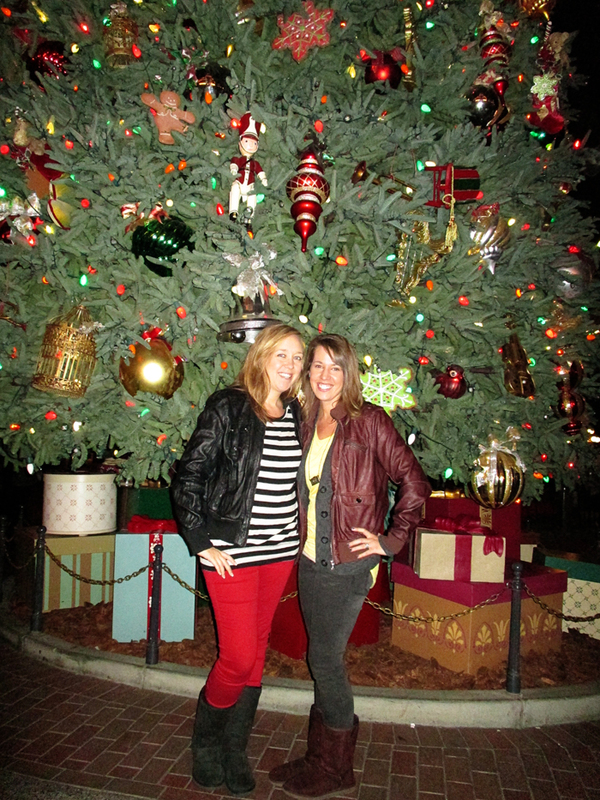 So much catching up to do while exploring Disneyland at its Christmas finest! Before going on Splash Mountain with the newlyweds… and before Amie was very upset with us for making her sit in the front row and get totally drenched. 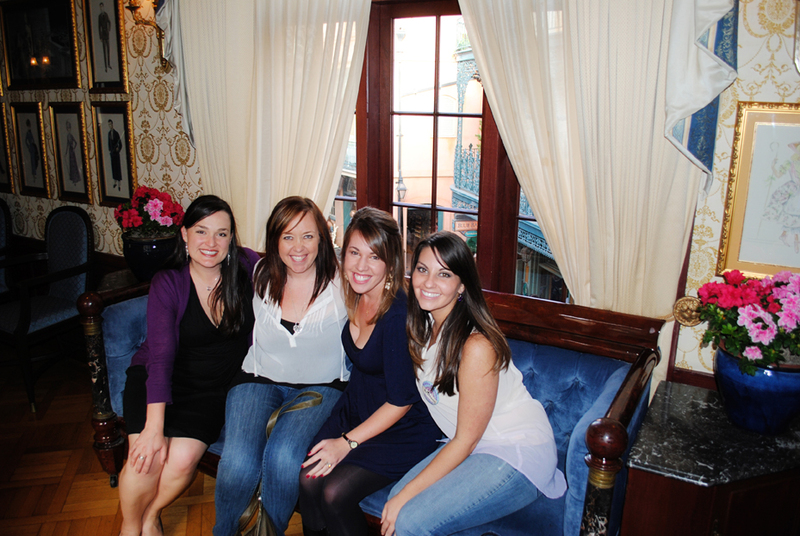 Celebrating our annual trip for Rachel’s birthday. Because I just couldn’t pick which Ryan boy to post! And because they are both just so darn cute!! One last trip before the husband’s pass expired. 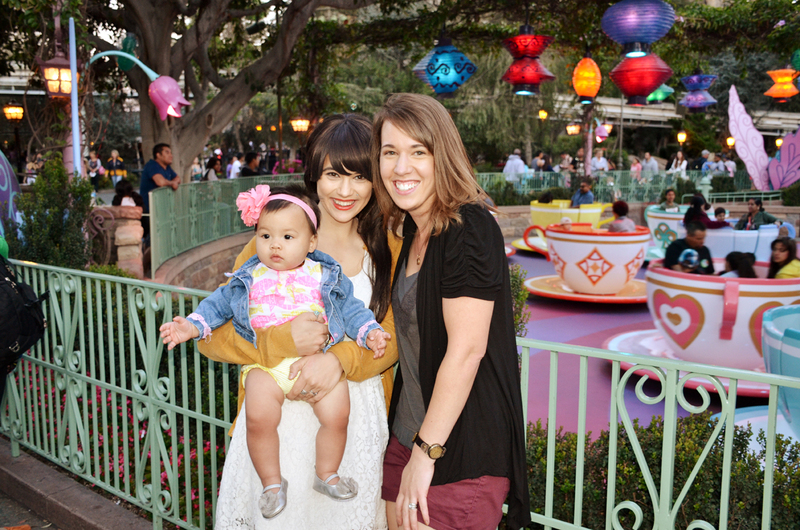 Molly’s first trip to Disneyland! 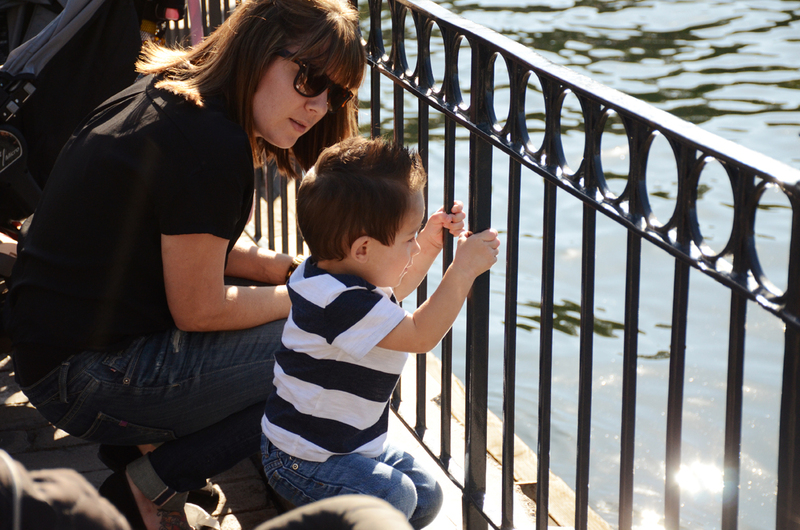 And her buddy Grayson and my buddy Jess looking at ducks… again, couldn’t decide which kiddo to show! More photos from this trip here. 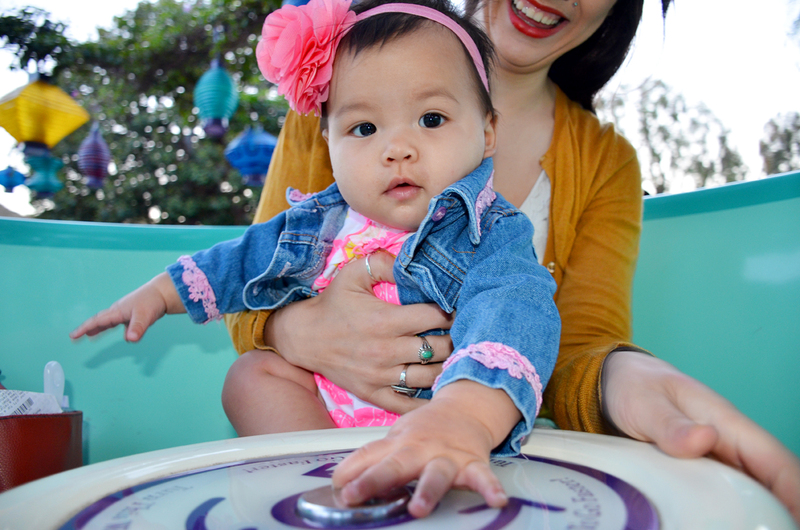 Mia took her first spin around the teacups during what we thought would be our last trip together! Another couple photos from this trip here! Another “last trip before the pass expires…” I just love watching the kiddos experience the joys we take for advantage. 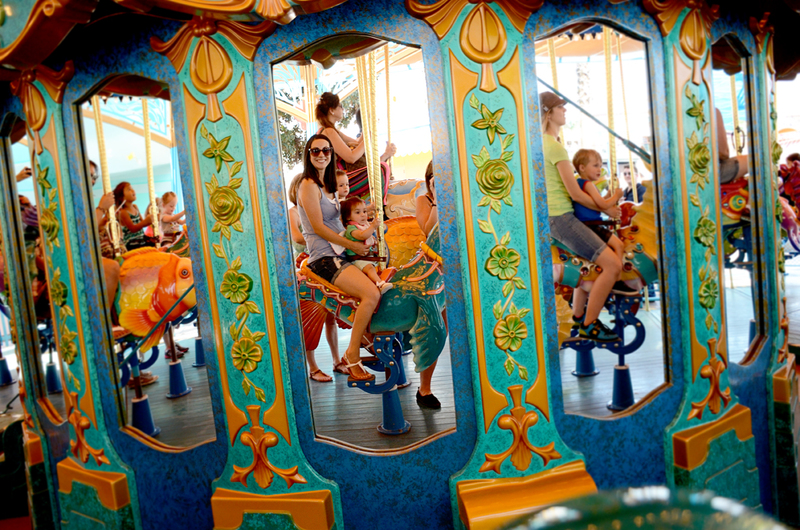 Like the fun of a carousel. 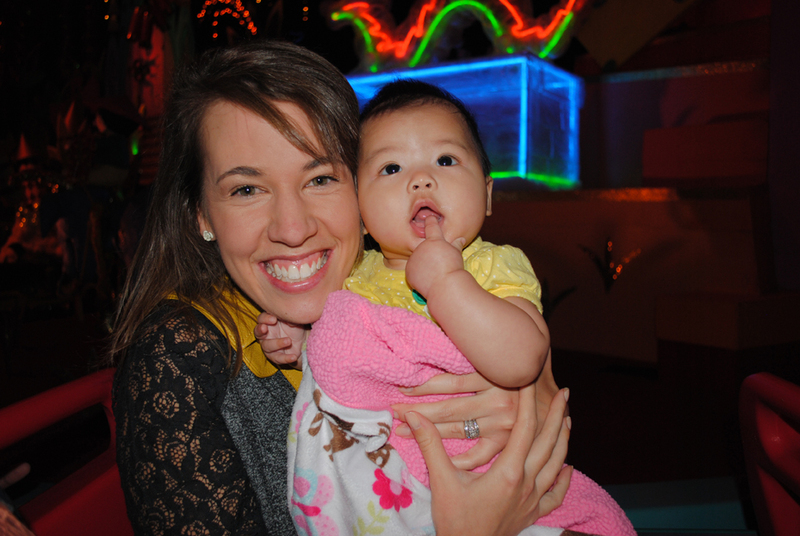 Since I started my pass and this post off with 8 month pregnant Rachel, I thought it was only appropriate to end with 11 month old Mia in her mama’s arms. Wow… what a year it was! I can’t promise you that I didn’t cry a few times going through photos to create this post. I love these friends of mine who are more like family. And this park that sometimes feels more like home. 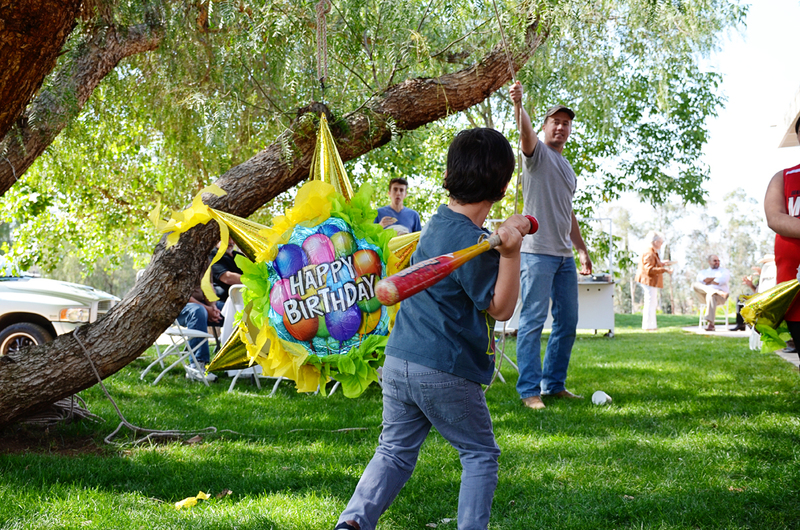 This past week was just so fun… from Disneyland trips to the birthday celebrations over the weekend… I spent a lot of time behind my camera capturing the moments. I feel so incredible blessed to call these people friends who are really more like family. 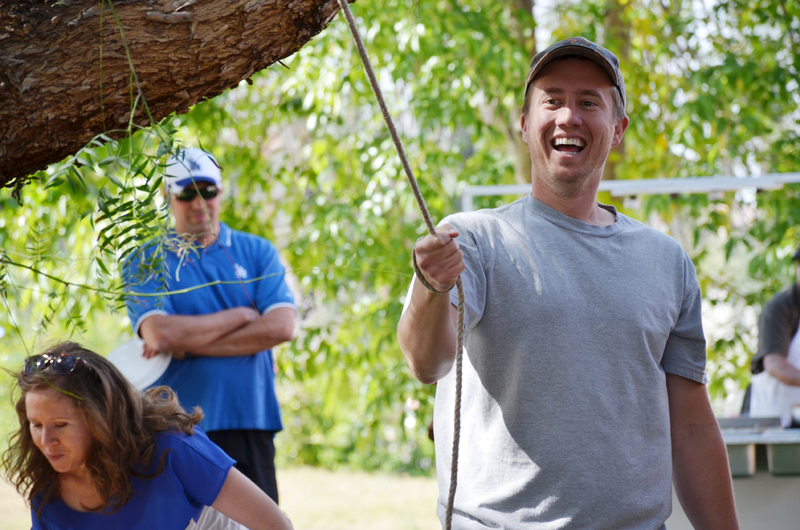 I just wanted to share a few of my favorite photos from this last week, just a glimpse of the joy I saw thru my lens. 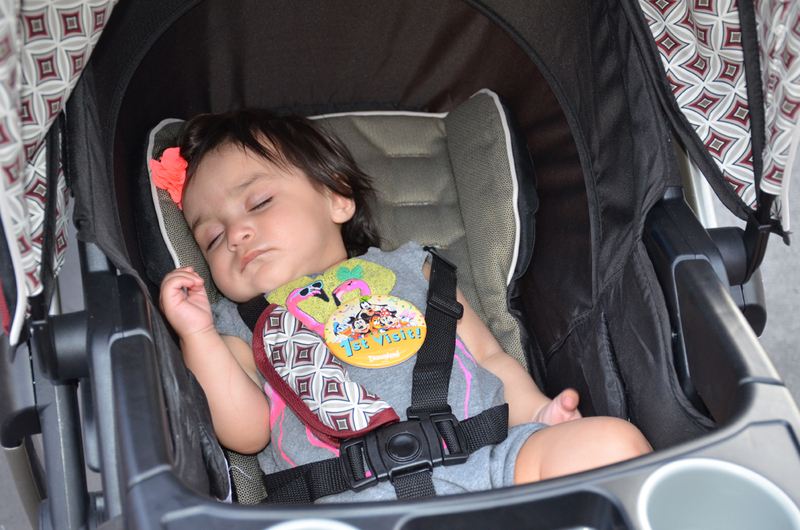 Molly’s first trip to Disneyland. 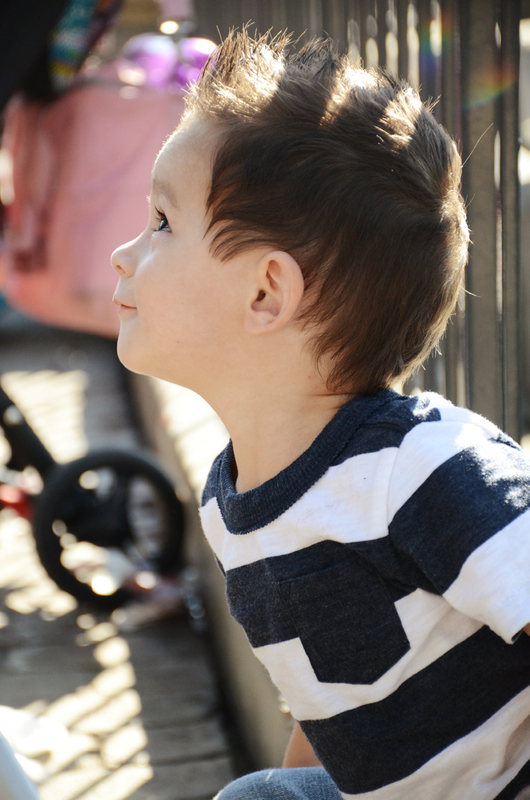 Just the cutest little profile of an almost 2 year old on a break from playing with the ducks. 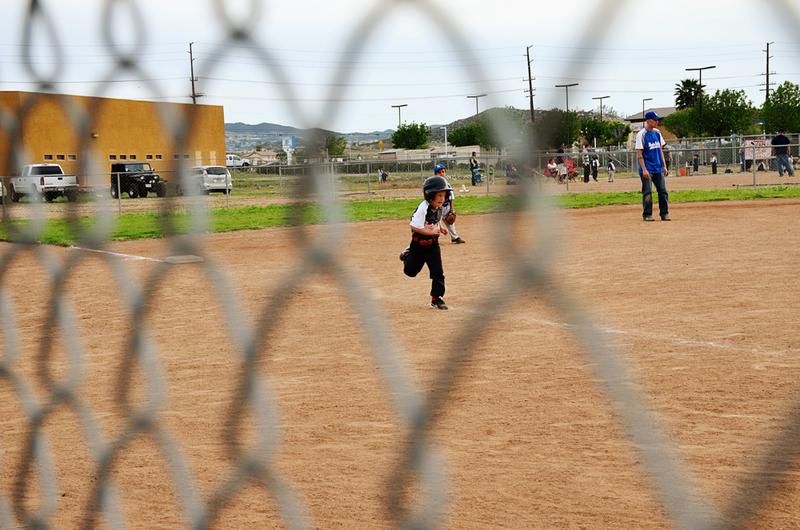 Eli runs home at his weekly baseball game. Trying to capture all my last moments [for awhile] of the Happiest Place on Earth. Amelia’s happy grin in her mama’s arms. 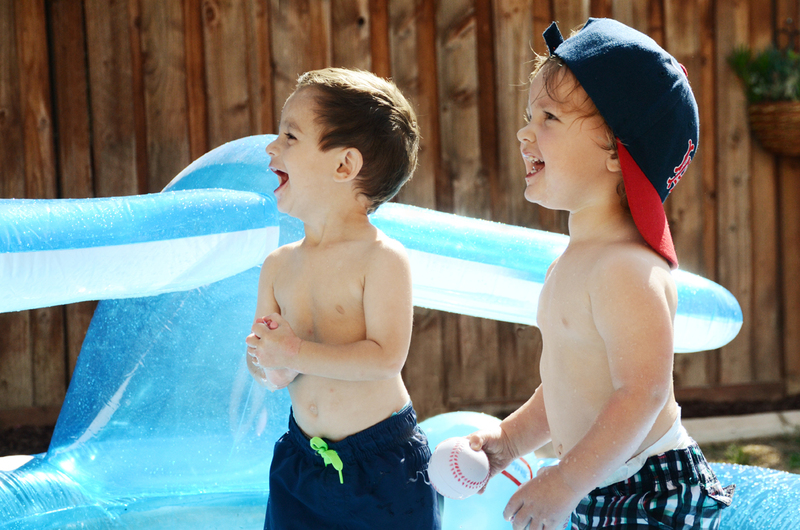 How cute are two 2-year olds!? I mean really, is there anything cuter?? 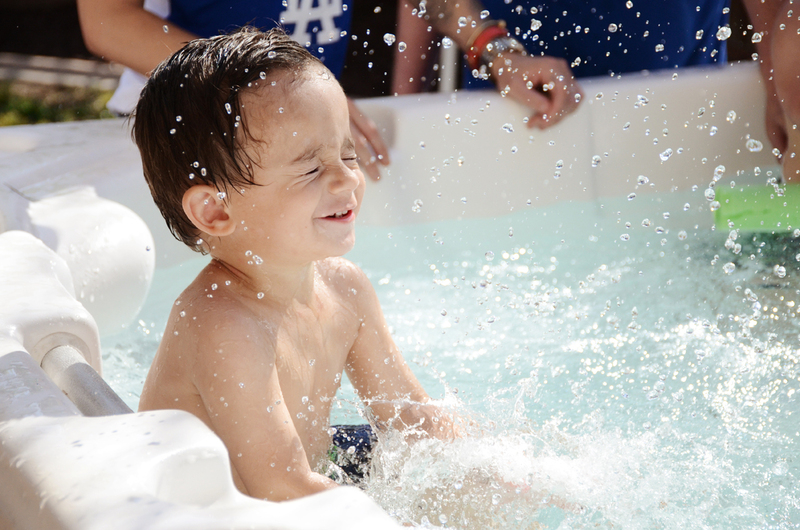 And then spa splashing fun! 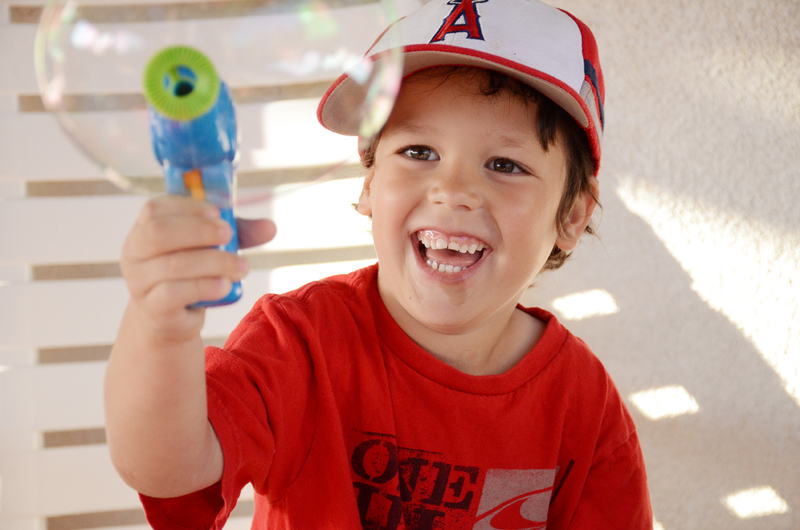 Eli’s fun with his new bubble machine from Auntie Yoyo. 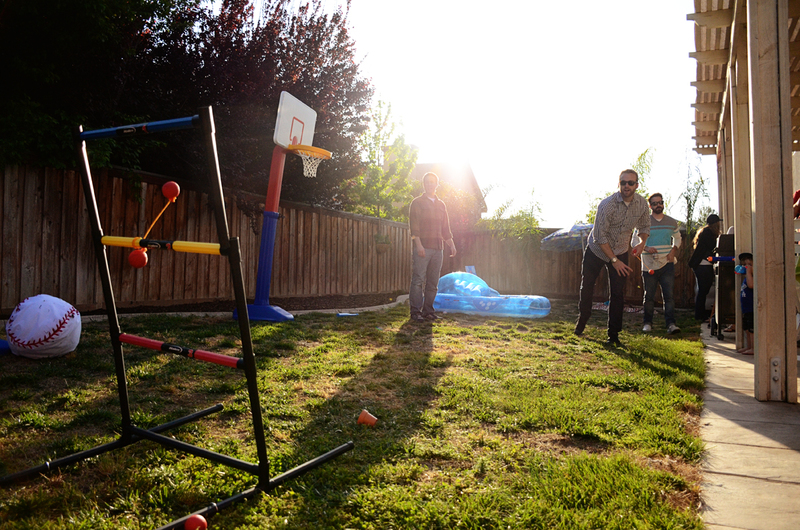 The big boys playing ball games. 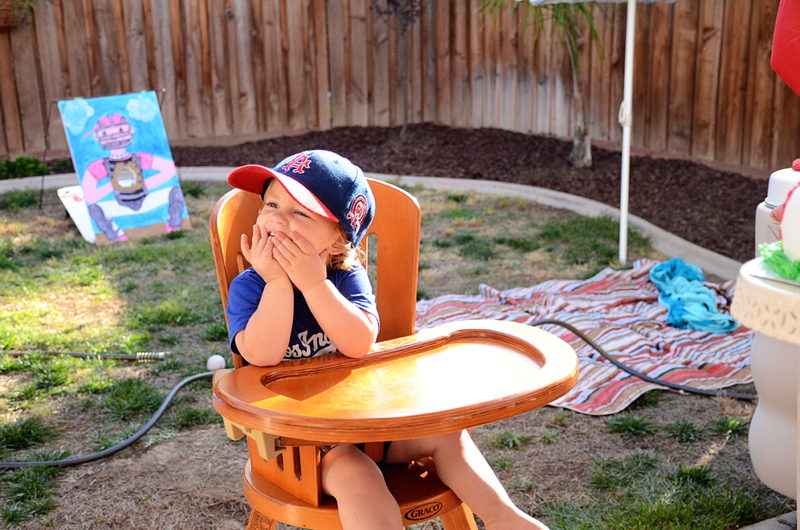 And to end the weekend, our new two year old Owen being so happily embarrassed during his happy birthday song. Hope you enjoyed loving life thru my lens! I love putting a face to a design that I’ve known and loved. I had seen this McDonald’s ad awhile ago, loved the painted textures and typography but never knew who created it. THen I ran acorss Jeff Roger’s portfolio. And his behind the scenes process images! And then I loved this ad even more. It’s just gorgeous work! See more of this campaign and more of Jeff’s work here. I’m obsessed with the intricacies of paper cutting… largely because I have no patience for it so I am in awe of what people can create with it when they take the time and have that inherent passion for creating art from scraps of paper. All that to say, I thoroughly enjoyed looking at all the teeny tiny details of this magazine cover for Seasons, from Eiko Ojala‘s portfolio on Behance. It is so intricate and chock full of details. See more here. Found via Mr. Cup. Not long ago, I posted about this new Disney show inspired by the It’s A Small World Disneyland attraction . I really loved the look of the show since it was heavily inspired by Mary Blair’s work. So when I saw this book at the Wonderground Downtown Disney gallery, I just had to have it! Illustrated by Joey Chou, the layouts are just gorgeous and so full of life! See more images of the book on Joey’s blog, purchase on Amazon here. Speaking of Disney art, you may have seen this image floating around the web this last week or two…. artist Tyson Murphy took a screencapture from 101 Dalmations and then painting over it to practice and explore the lighting of the scene. Really beautiful work. Love the little bits of debris and other items caught in the light. Also see one from Sword in the Stone. I love Jess’ Whip It Up Wednesday posts… where she posts a quick little craft project. They’re usually pretty easy and something that can be “whipped up” within an hour or so. But I was super excited to see this DIY! A few months ago, her hubby Scott made me the most amazing shelves that used this painting technique. And I seriously love them—for so many reasons—but the paint job is my favorite! Follow this link to see the rest of her post. I’ve already painted a frame following her tutorial, it was seriously so easy! 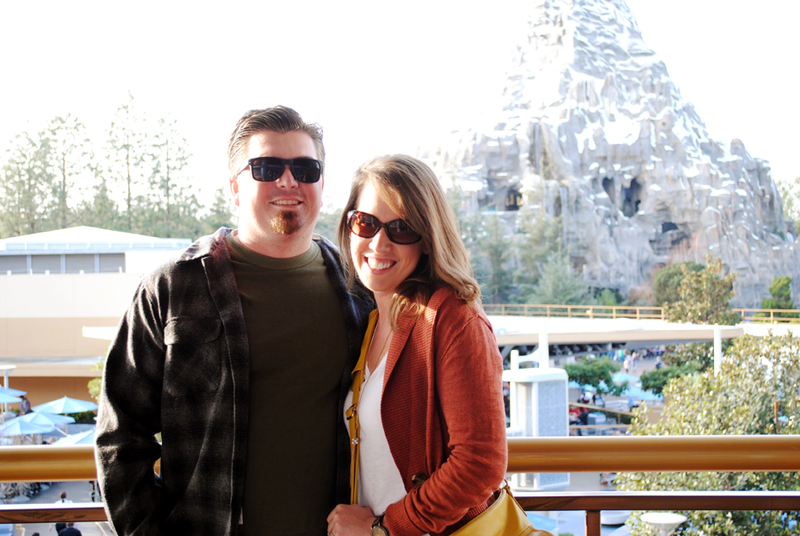 Many people are shocked to find out I only truly fell in love with all things Disney[land] just when I met my hubby 10 years ago. I grew up on Disney’s movie magic and loved the random trips we took as kids but it wasn’t until Andy pointed out the random holes in the wall on the Pirates of the Carbibbean ride and asked if I could see the Hidden Mickey—that my love for Disney grew into a passion. 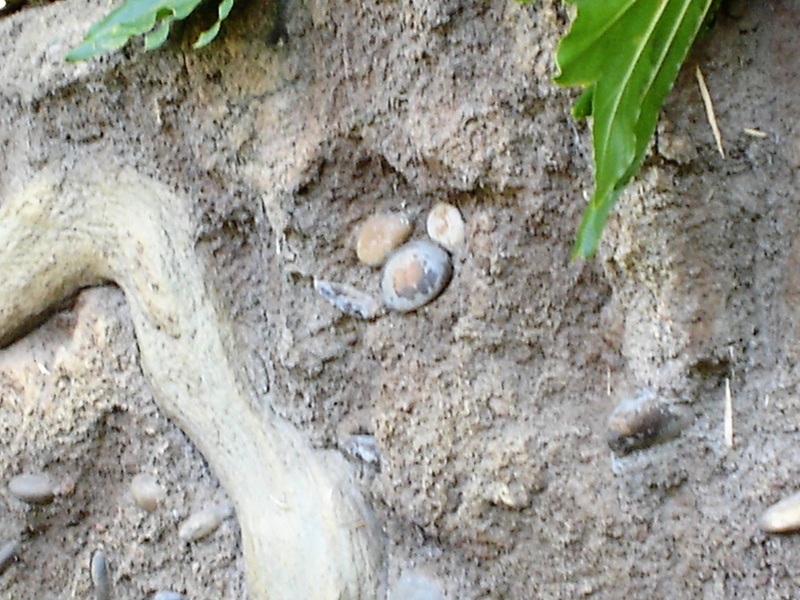 What kept me so entranced by these hidden gems is the artistic detail the park Imagineers tended to. All this “hidden stuff” is just bonus fun to an already amazing place to visit. It’s what kept me going back trip after trip, year after year. 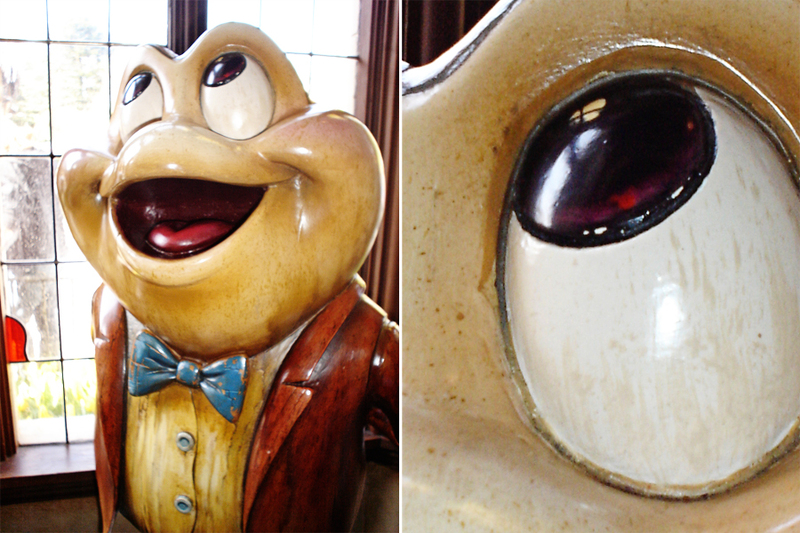 It’s these small details that place the quality of Disneyland over an other amusement park. So I just wanted to take some of these little gems and share them with you! And just like Andy sparked my curiosity oh so many years ago, hopefully I can spark yours! All the photos below were taken by me, or friends, over the last 10 years of having our annual passes. 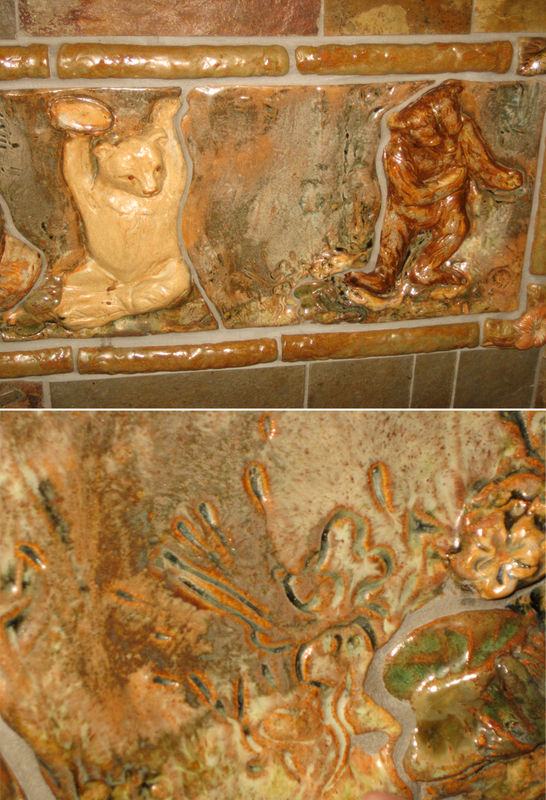 An official Hidden Mickey: a partial or complete impression of Mickey Mouse placed by the Imagineers and artists to blend into the designs of Disney attractions, hotels, restaurants, and other areas. 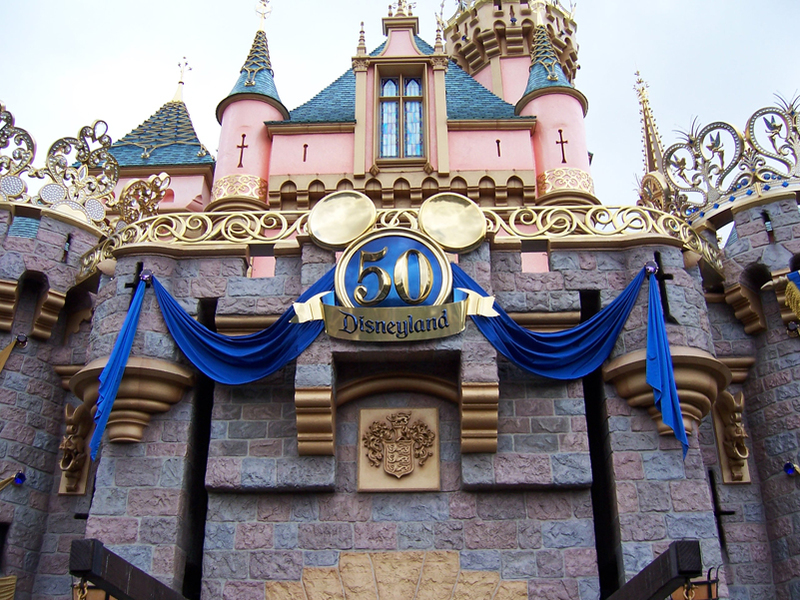 The 50th anniversary celebration really brought Hidden Mickeys to the forefront. Where to many, the idea of Hidden Mickeys were somewhat mythical and unofficial, the 50th anniversary placed 50 “hidden” Mickeys throughout the park. Many were very obvious finds while a small percentage were trickier to find. 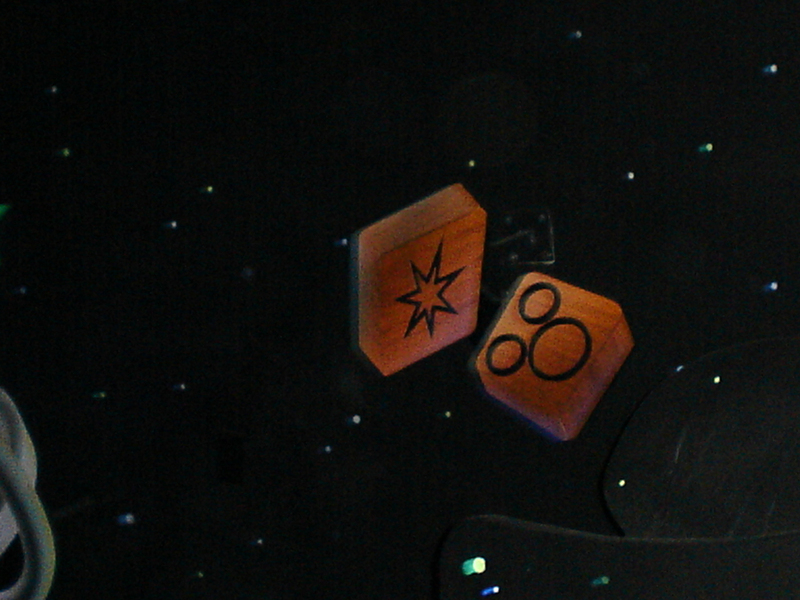 But these small hidden gems, go beyond just those three interlocking circles. 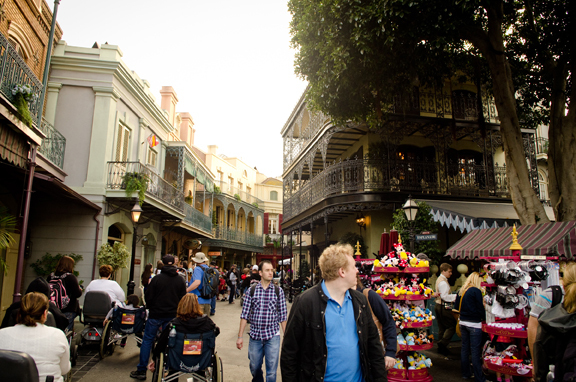 There are many more nods to other characters, and even past rides—or whole restaurants! Let’s take a grand circle tour of the park, shall we? There are a great many nods to the past found in the Main Street windows. 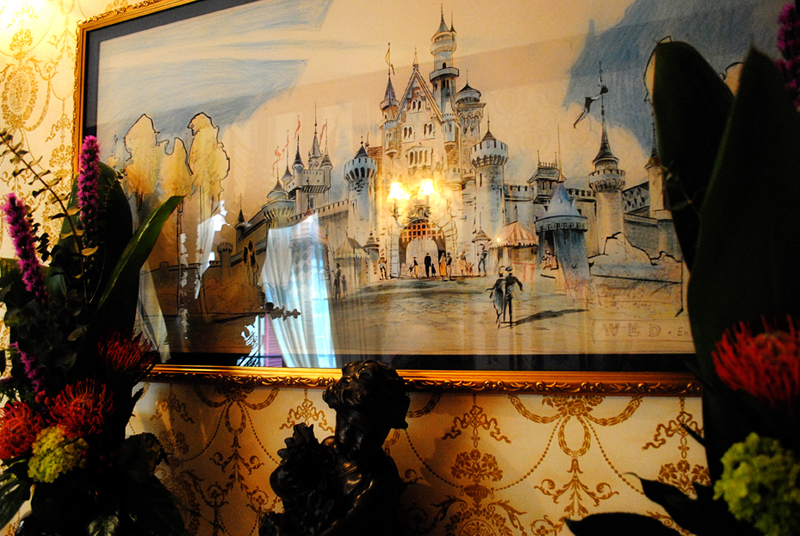 Many of the painted window advertisements acknowledge past Disneyland Imagineers, artists, and animators. 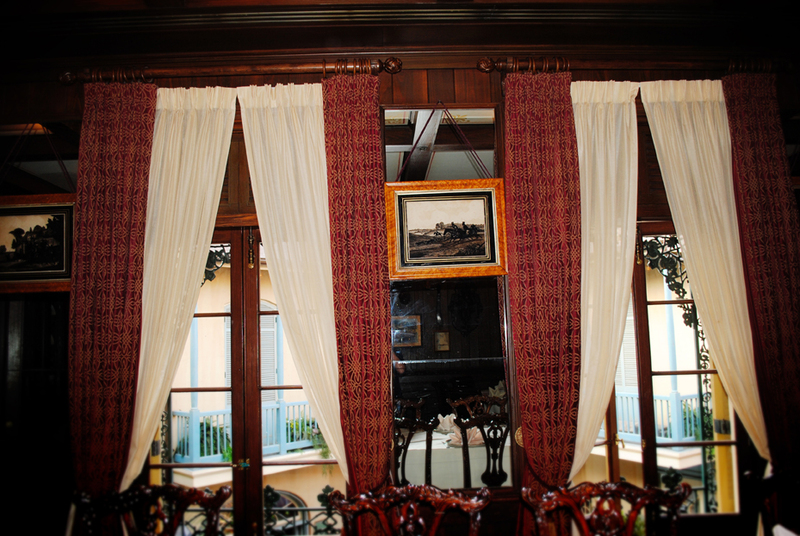 One of the more famous windows is for Elias Disney, Walt Disney’s father. 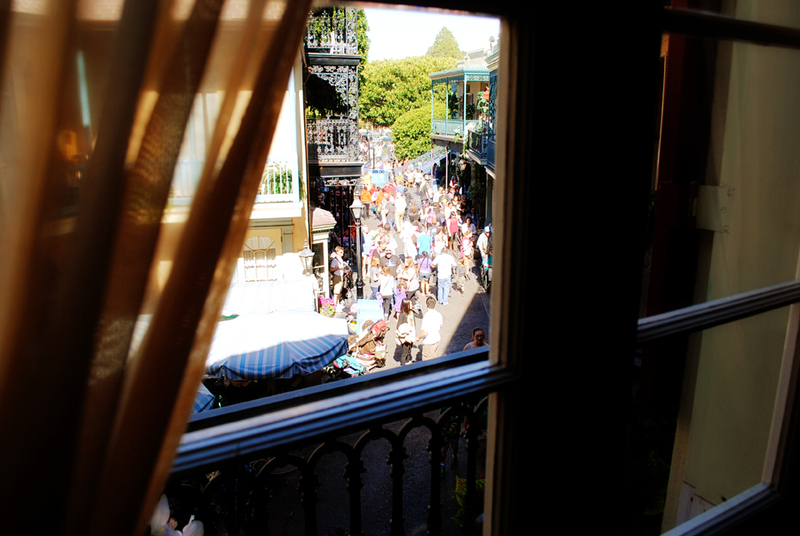 Another famous window, and room, is above the firehouse where Walt Disney used to stay after hours in a furnished apartment. There is still a light in the window that is always on in his memory. 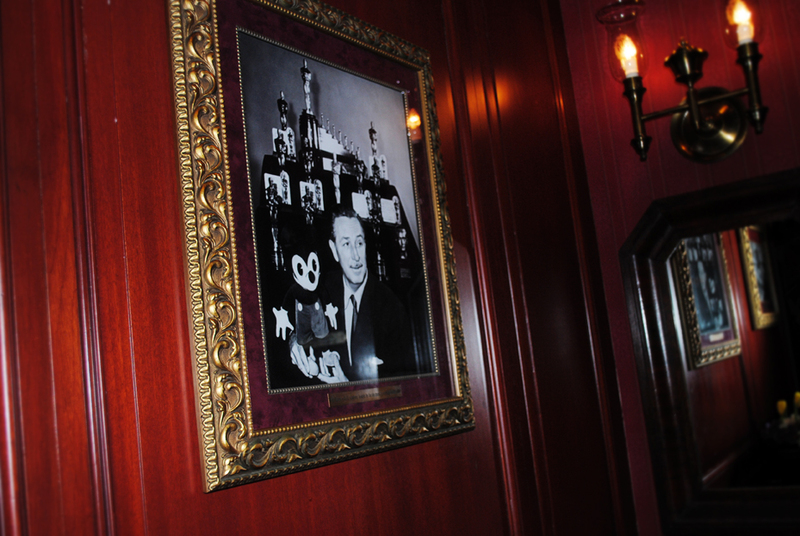 Find this Hidden Mickey in the Main Street Cinema. My favorite Hidden Mickey is found in the top windows of Big Ben, of the London scene in the Peter Pan attraction. You can see just a silhouette of Mickey Mouse waving to you just as you finish circling the tower. 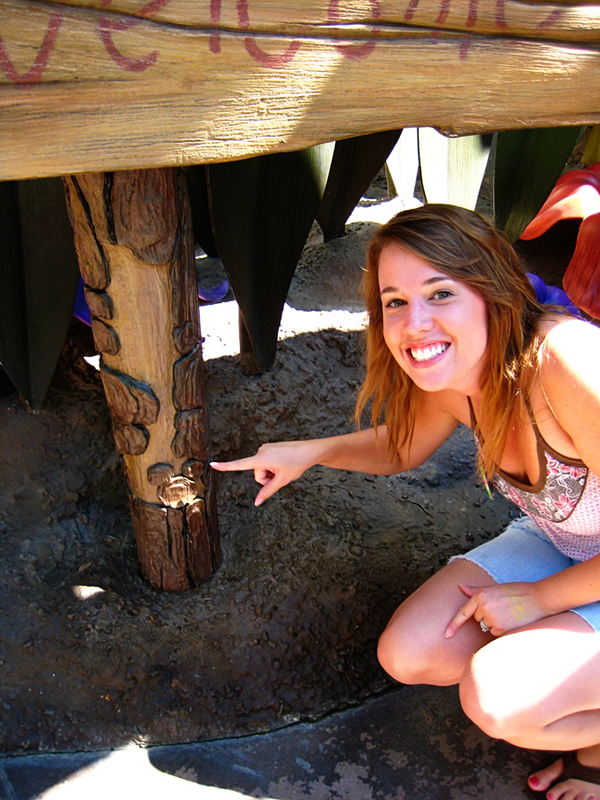 I was quite excited to spot a Hidden Mickey at the entrance to Pixie Hollow! 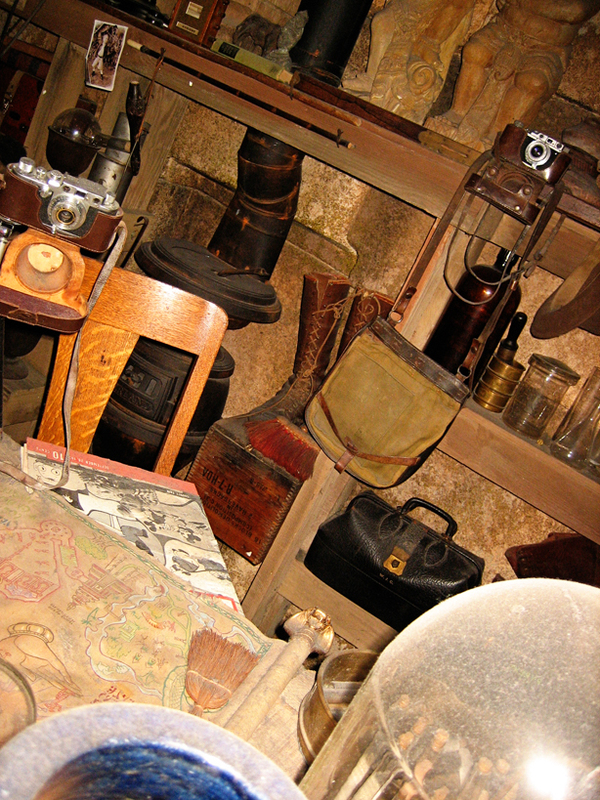 Indiana Jones has so so so many amazing finds! In the projector room, ask the Cast Member at the front of the line if they have a flash light. If so, they can show you, up in the rafters, an old Eeyore sign from the parking lot that stood in place before Indiana Jones was built over it! 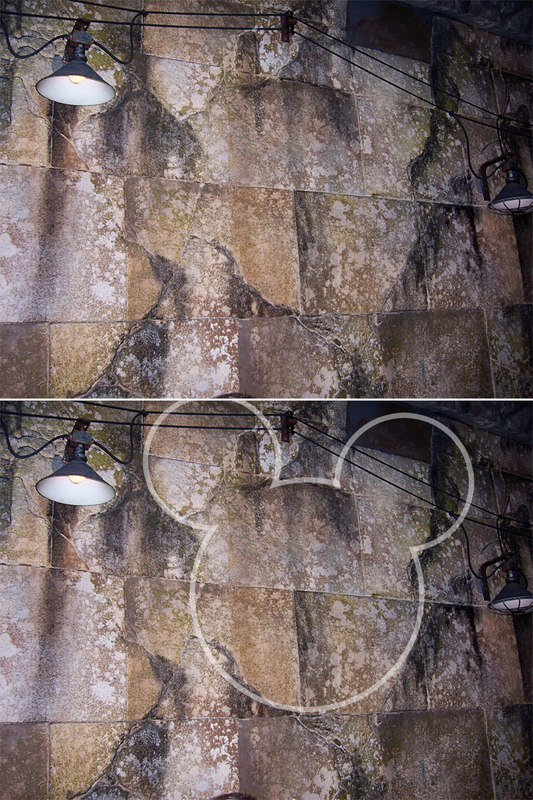 And then just before you leave the projector room, look back at the left wall and you can see a very subtle but GIANT Hidden Mickey on the wall made from the rocks and cracks. Another Hidden Mickey lies in the very next room, on the desk on the cover of a magazine is a scene from one of the original Mickey black and white cartoons from the same time period that Indiana Jones took place. 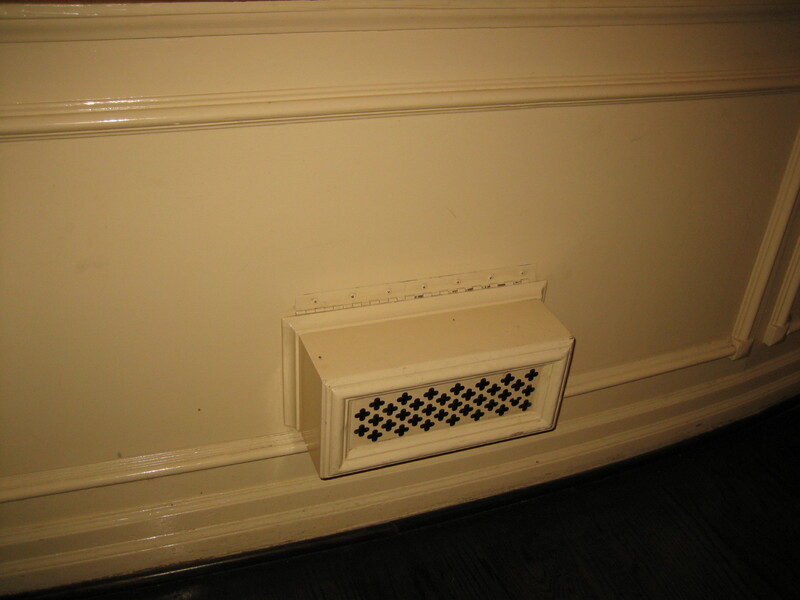 These are my favorite kinds of Hidden Mickeys… where they seamlessly fit with the theme of the room and are pretty out in the open but still subtle. Another amazing fun Mickey find is on the ride itself. As you’re entering the first skeleton/bone room, look back over your left shoulder and you’ll find a skeleton leaning against the wall that is wearing those classic Mickey ears hats! So fun but so very hard to find! We once rode it over and over until we found it and now I can’t-not see it! 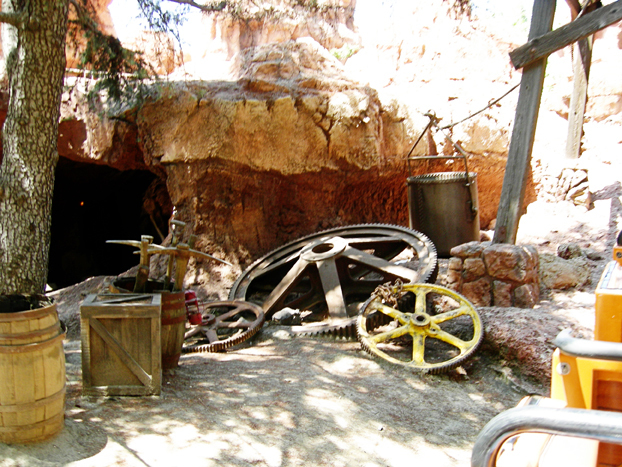 Like I mentioned, there’s a lot more “hidden” than just Mickeys. 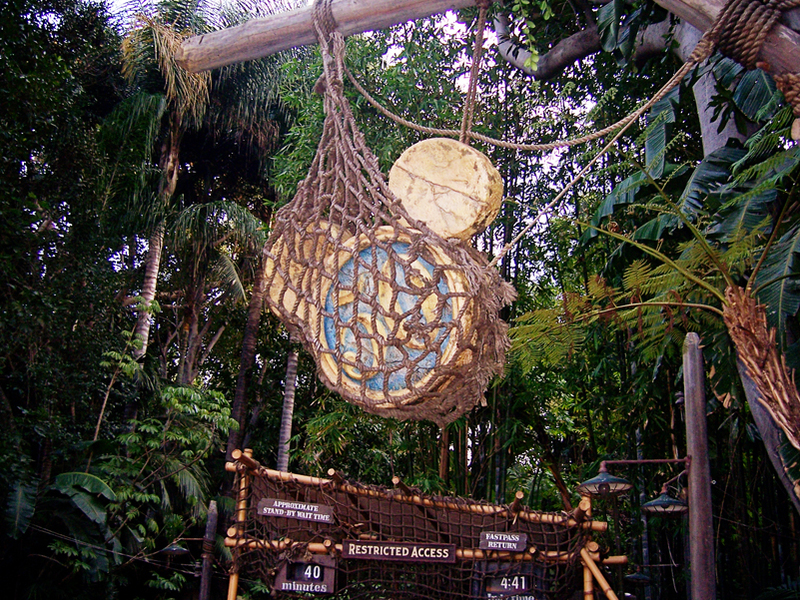 Sitting on top of the Jungle Cruise building sits a familiar totem from the Tiki Room. And notice any other familiar characters from our beloved Beauty and the Beast sitting in the Tarzan’s Treehouse camp? 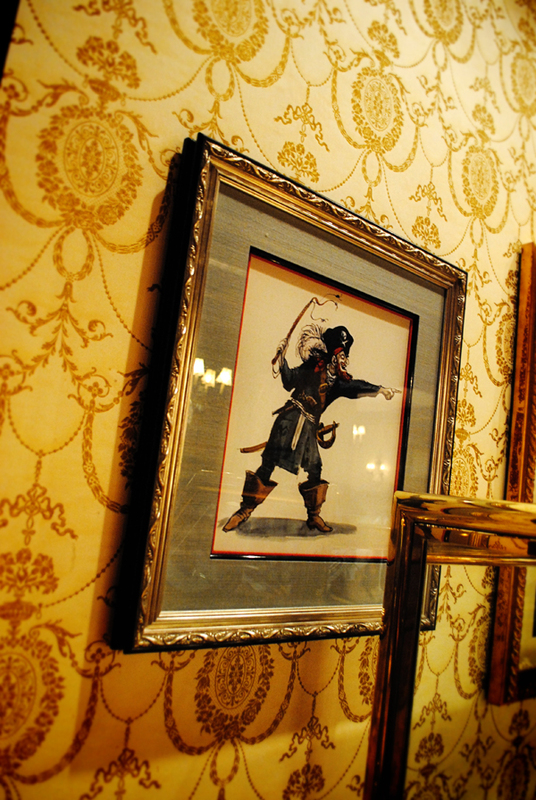 I mentioned the Hidden Mickey on the Pirates ride earlier (in the top center of the right wall in the big ship fight scene)… but another fun fact is that the skull in the bedroom scene on the left is from an actual real life skeleton! At the time, 1960s, the technology to create realistic skeletons wasn’t quite there yet, so they got a hold of a bunch of real skeletons from a doctor friend of Disney’s. Since then, they’ve replaced the majority of the skeletons with artificial replicas but the skull in place above the skeleton in bed is still one of the originals! You can see the difference in the color tone as well, the original is a darker brown while the replica in the bed is whiter. 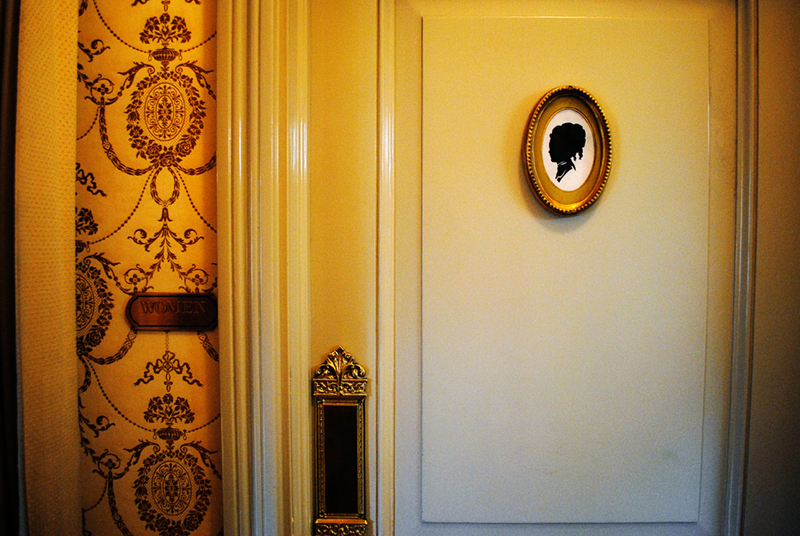 A very well known and easy to find Hidden Mickey can be found in the dining hall of the Haunted Mansion attraction. 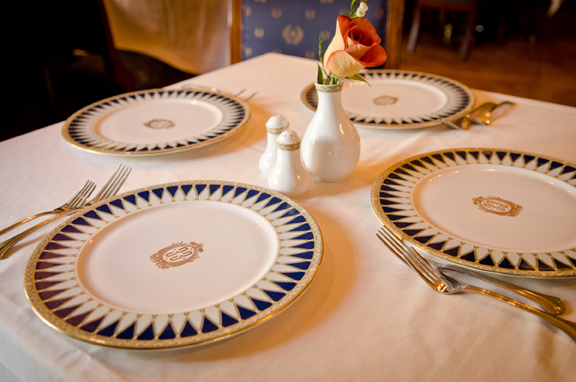 With an always changing display, you can find the tri-circle Mickey among the dinner plates. 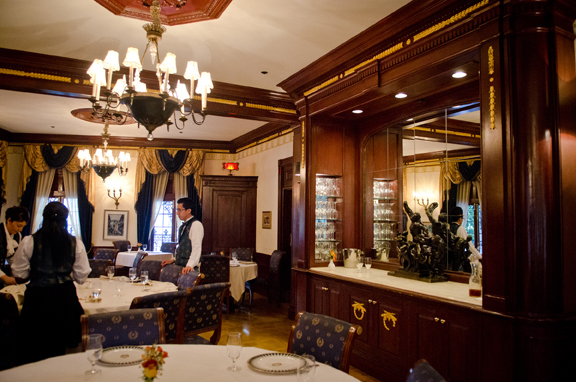 I’m not sure if this really counts at this point, but Club 33 (posted about last year’s visit here and here) is a somewhat secretive restaurant. The more appropriate word though may be “exclusive.” It remains to be a secretive location because it is so exclusive and so expensive! Like the Eeyore sign, I love when the new rides give nods to what once stood before. 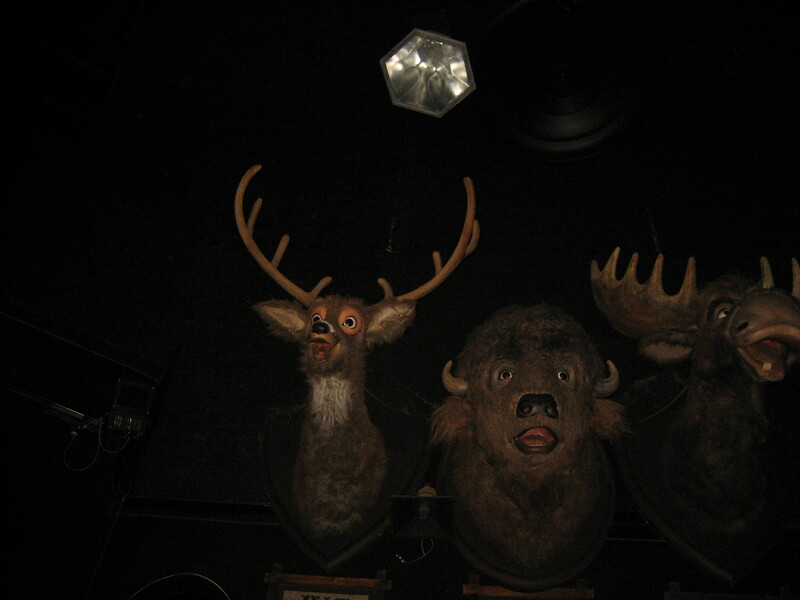 On the Winnie the Pooh ride, you can see the deer, buffalo and moose heads that once hung on the wall of Country Bear Jamboree! It’s easiest to see them when you’re sitting in the front row of the honey pot, turn all the way around when leaving Pooh’s dream scene and they’re found just above the archway. Also, find a Hidden Mickey along the right wall after that in the honey. 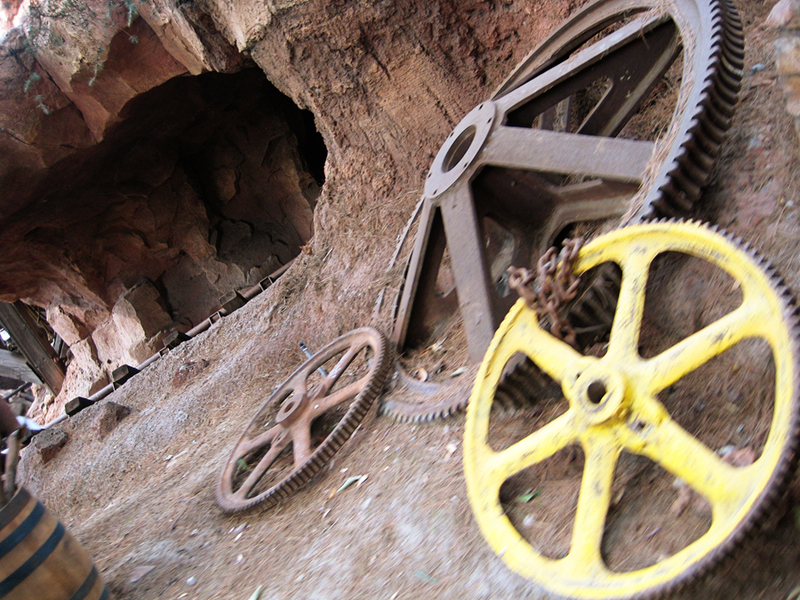 Find this next Mickey while riding Big Thunder Mountain… however with the recent overhaul of the ride, this may not be there anymore! Can you find the odd ball out in the Golden Horseshoe? 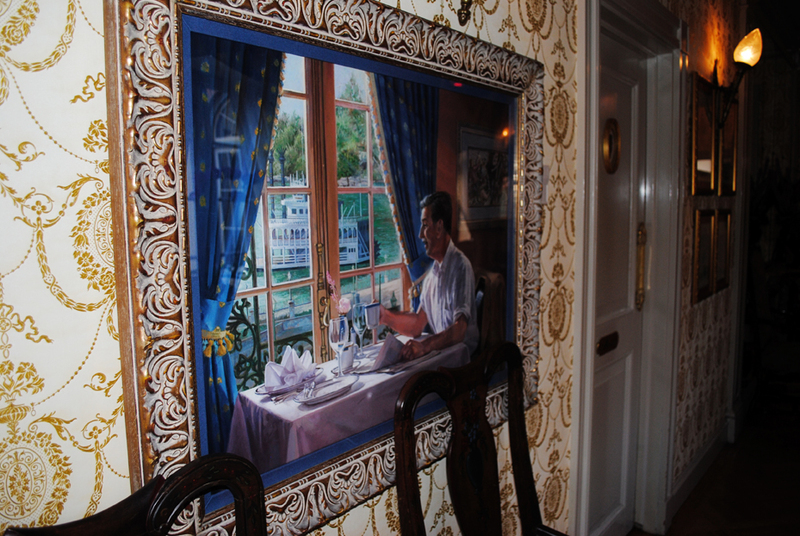 You may remember the attraction that once stood in place of Innoventions… America Sings. 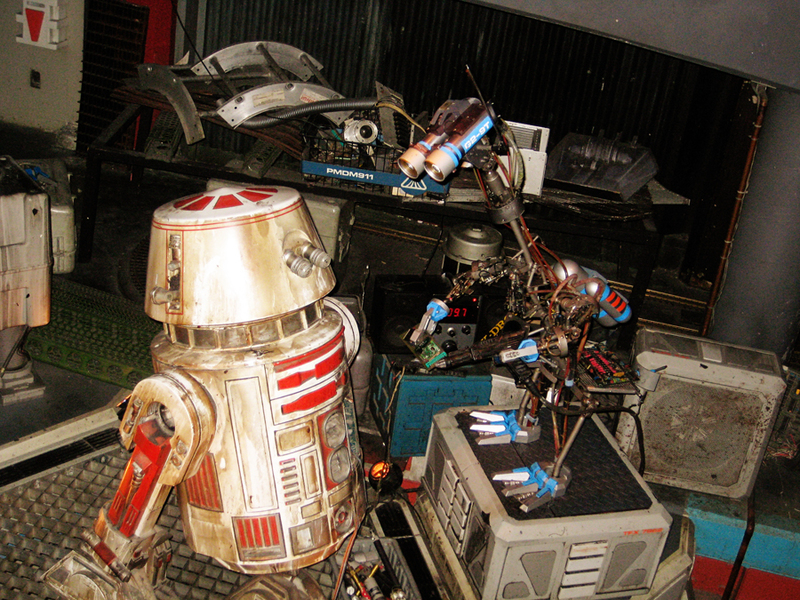 Some of those singing chickens found their way to Star Tours—just without the feathers! You can see the chicken-like resemblance in the feet of the robot on the right! Toontown is on a whole other level when it comes to Hidden Mickeys. 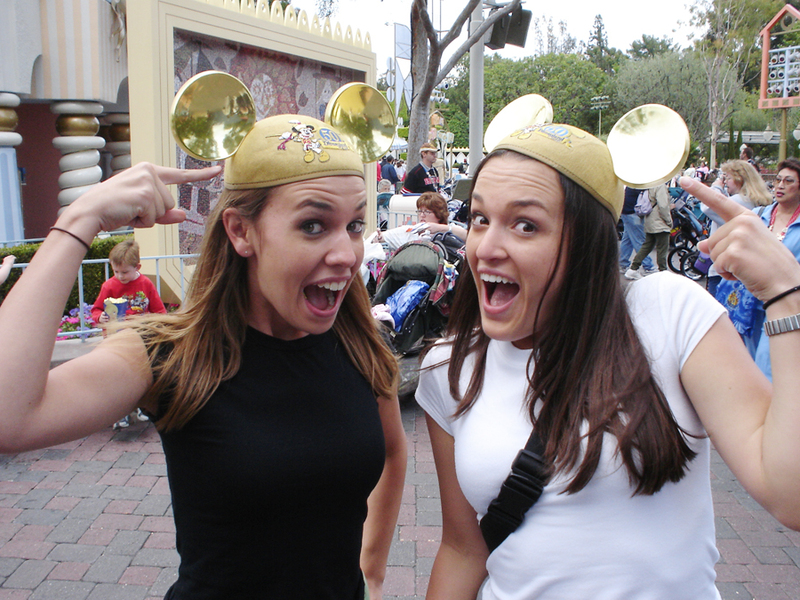 These Mickeys are so obvious and more just for decoration, so they’re called Decor Mickeys. 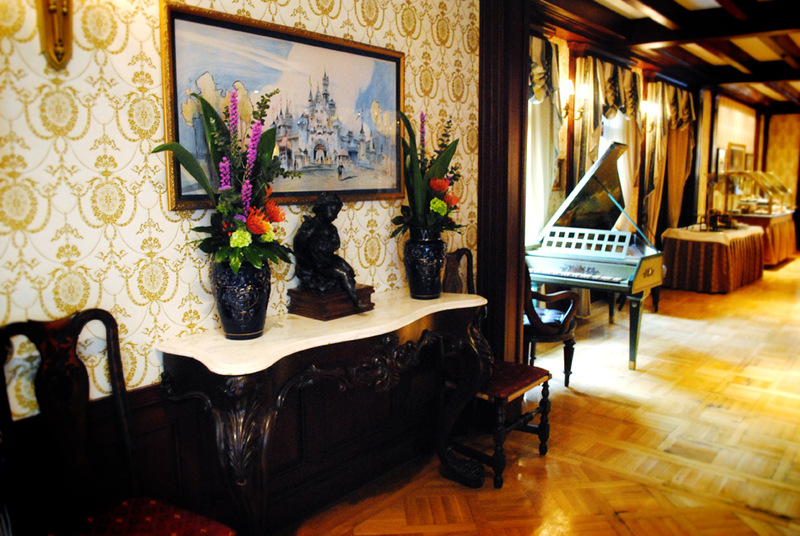 So many examples of which can be found in Mickey’s house itself. Even the music notes are little Mickeys. 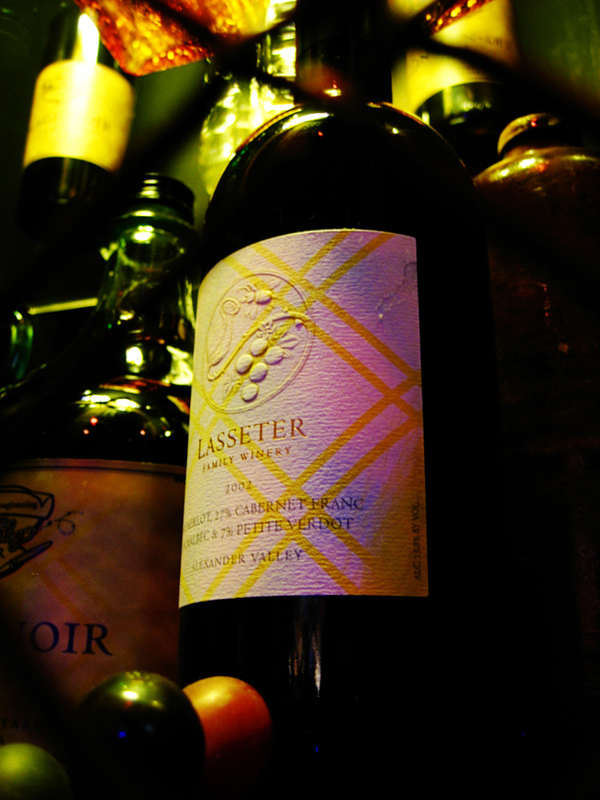 You may recognize the owner’s of this mock wine label as the Creative Director of both Disney and Pixar: John Lasseter! 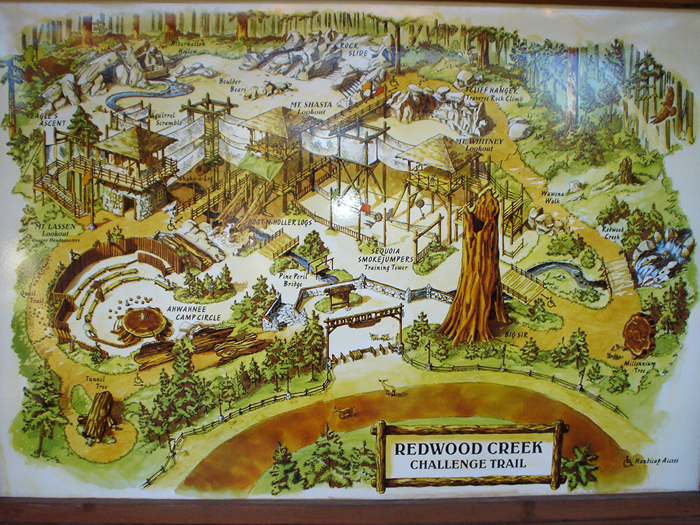 There are at least 3 hidden Mickeys in this map to the Redwood Creek Park. There’s usually a cast member on hand to aide in the search as well. Find this little guy toward the end of the Heimlich’s Chew Chew Train ride on the right side. There’s a good chance in all splashes of bubbles, water, or even honey (Winnie the Pooh) that there lies a Hidden Mickey. 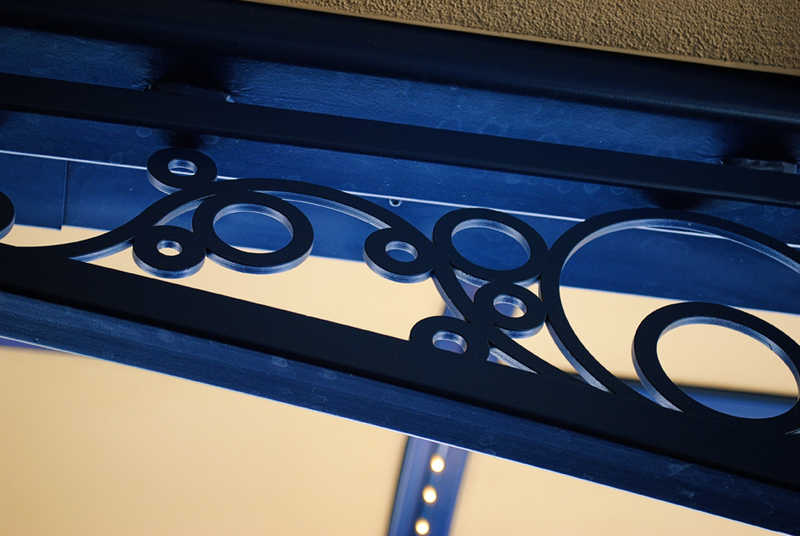 Find these bubbles in the ironwork outside Ariel’s Undersea Adventure. 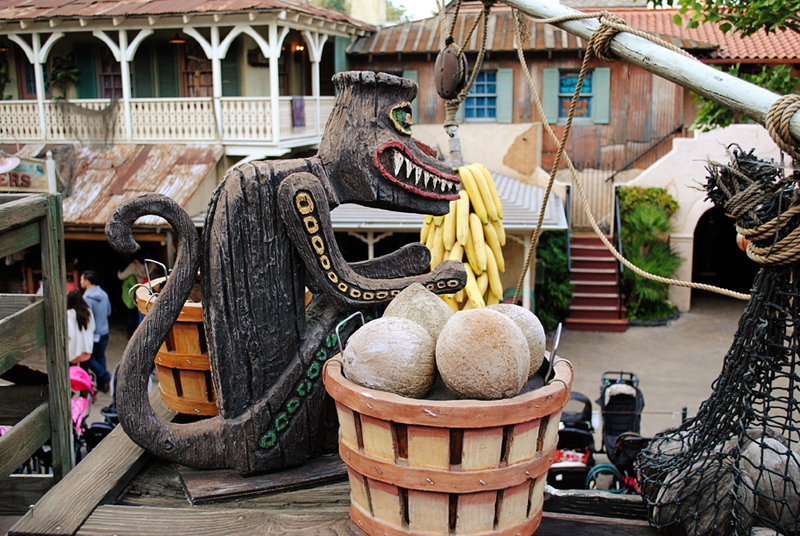 Keep your eyes out for those pesky Disney cats… it’s my hubby’s absolute favorite secret of the parks. When the park first opened, it had such a horrible mouse infestation that they unleashed a plethora of cats to capture them all. Only that led to a bunch of cats that have remained escaped all these years. 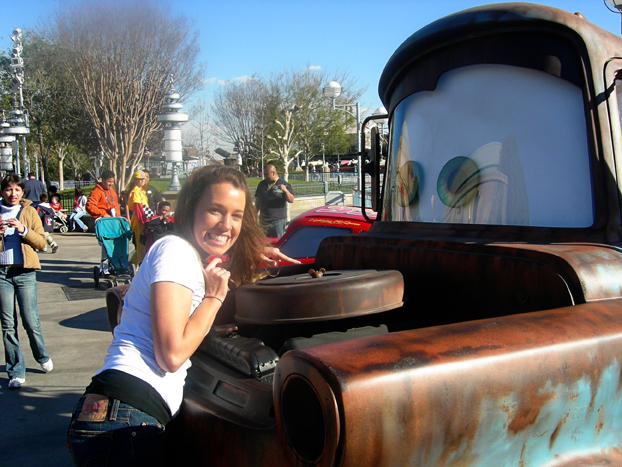 We’ve found them mostly around the Rivers of America and along the train route but once had a cat spend quite a lot of time with us in the area that now houses California Adventure’s Radiator Springs. Along Disneyland Drive, near the corner of Katella, you can find this giant Mickey made out of the sidewalks. Many pedestrians walk this every single day and probably never really know or care to think about its odd shape! 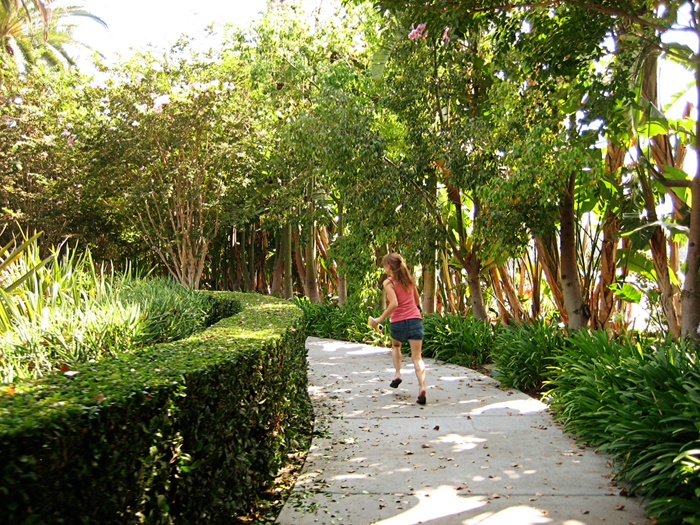 Here I am excitedly running around the Mickey with my Hidden Mickey book in tow. haha nerd alert! This cleverly hidden Mickey is within the concierge counter of the Grand Californian Hotel… there’s also a hidden fairy (not pictured)! Do I really need to help you find this one? You’re a pro now! 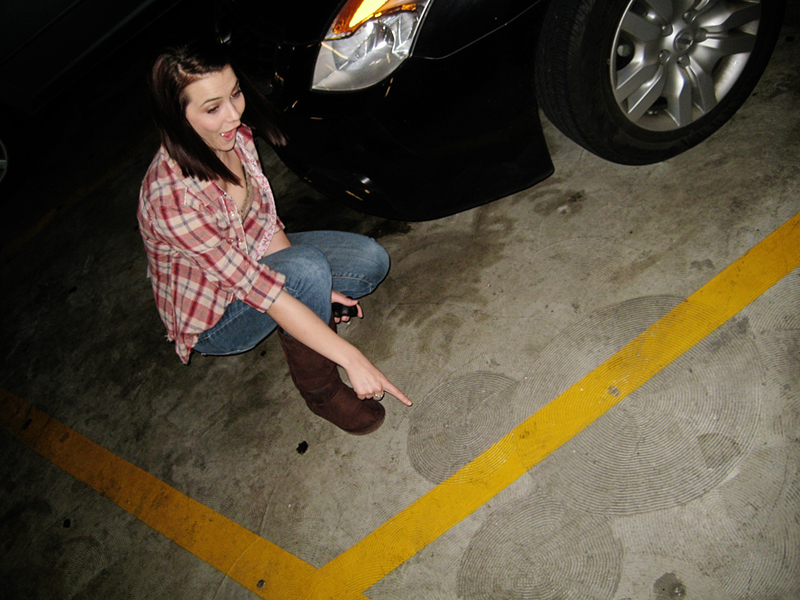 Find this fun Mickey on the Daisy level of the parking structure! Hope you enjoyed this post and will have fun finding some of these and more yourself! Many thanks to my friend Lindsey who scampered around the park finding many of these little guys with me! 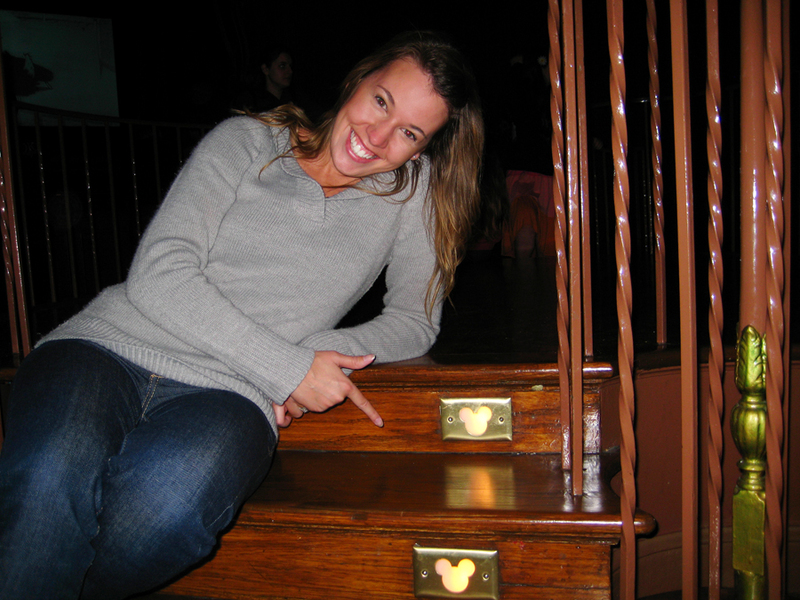 If you want to try to find some of the above secrets and many many more… check out this great resource: Disneyland’s Hidden Mickeys: A Field Guide to Disneyland Resort’s Best Kept Secrets. It goes much deeper than just the Hidden Mickeys. Also has two routes to take, a very descriptive way of finding stuff (like a cheat sheet), or a harder and less obvious hint to find them. There’s also a fun app, for the less serious secret finder called Wishing Stars. 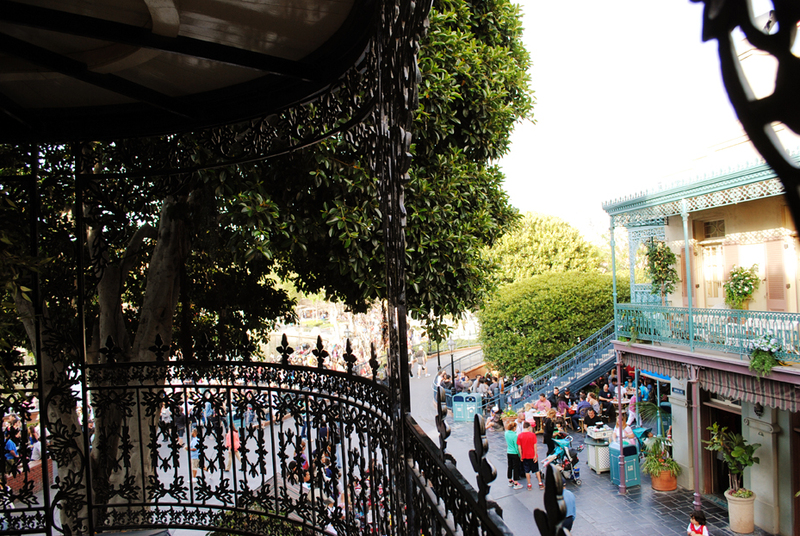 So what are your favorite secrets of this beloved park?? How do I keep going without getting bored? Go on a rainy day. This is one of my favorite “secret” tips. It’s a widely known fact that the residents of southern California are ever fearful of water falling from the sky and scatter at the first raindrop—making these days the best Disneyland days. 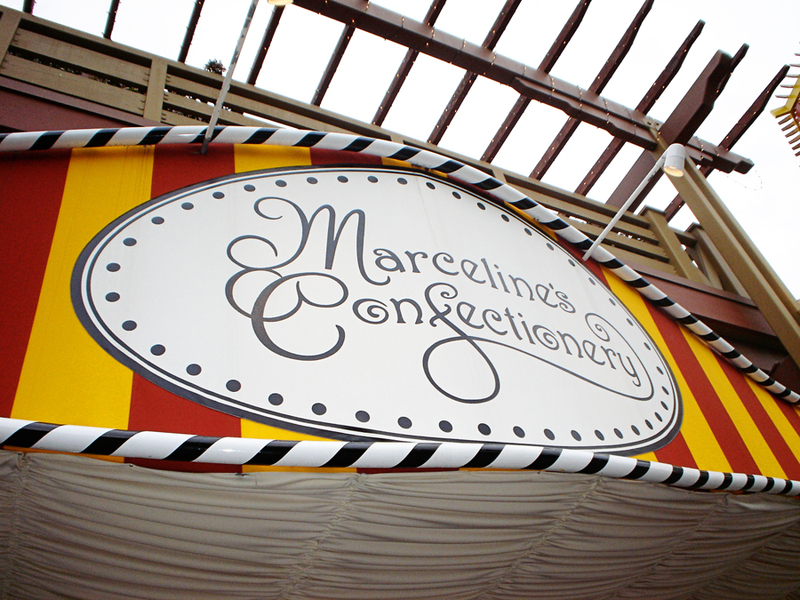 No lines, no crowds, no heat… just a few raindrops and breaking records on quantity of rides! Better yet, go on all the water rides, especially Splash Mountain and River Rapids, more than likely you won’t have to wait in any lines. 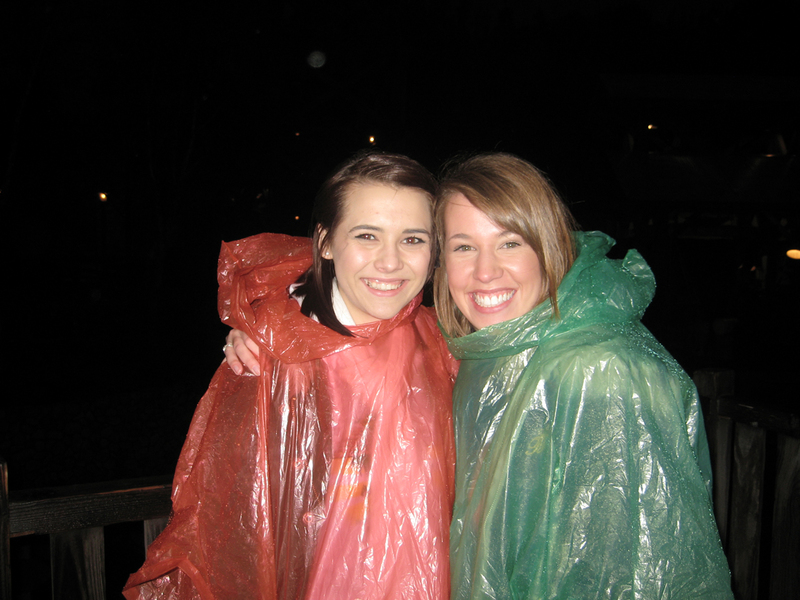 And if you really don’t want to get totally soaked, stop by the store on the way for some $1 ponchos! 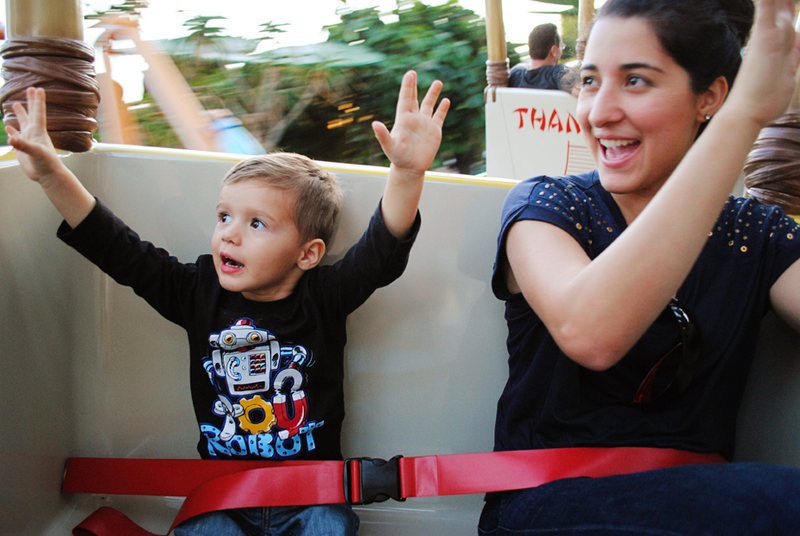 Start your day off right with a ride into the park in style, up front with the Monorail conductor. 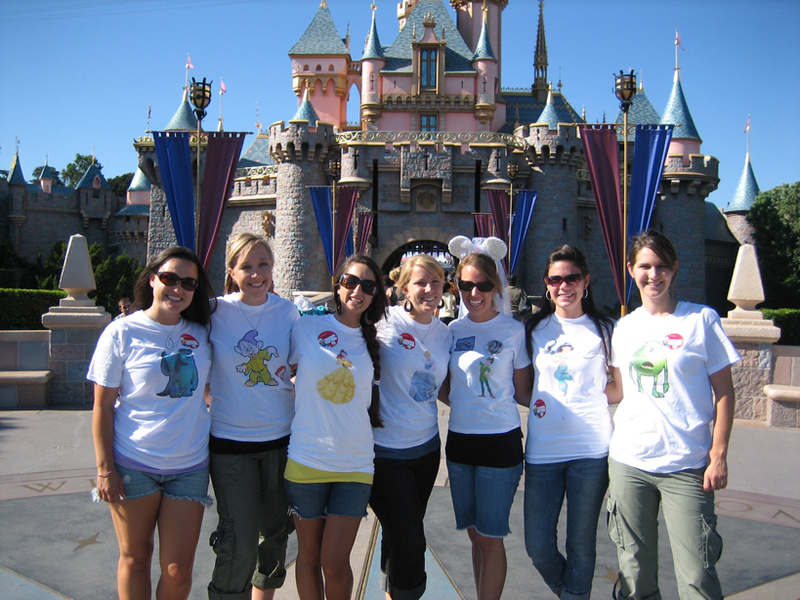 Disneyland has a few unofficial dress up days like last weekend’s Dapper Day, but one of my favorites was when my girlfriends and I dressed in matching shirts with our favorite Disney characters for my bachelorette party. 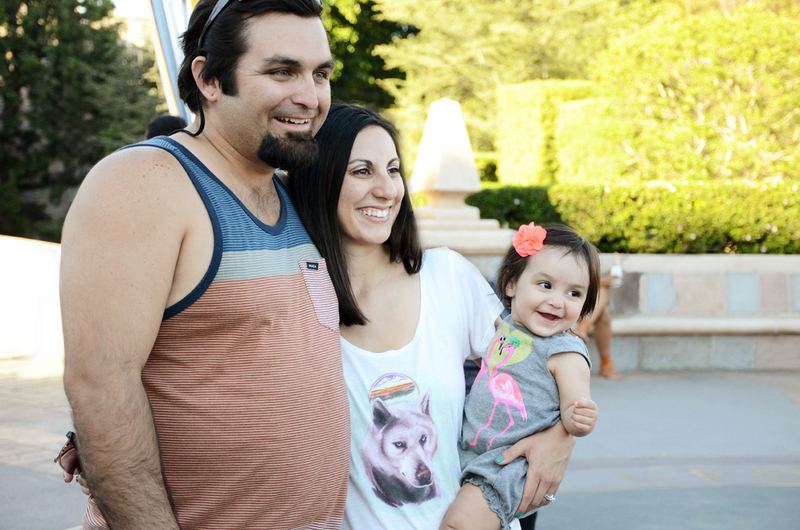 Speaking of photos in front of the castle… Whenever you go to Disneyland, you pretty much have to take a picture right smack in front of the castle. But now that that spot’s practically a mob scene, I would totally recommend branching off to the sides of the castle to get your favorite family photo. 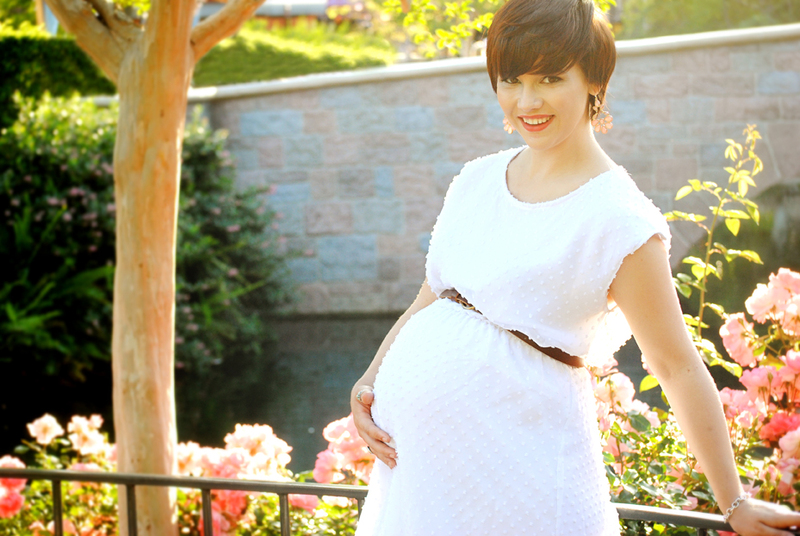 Plus, your family moment will be much more intimate than fighting for space in front of the castle. Enjoy the different seasons. From Halloween to Christmas. Not only is the parked decked out in its finest, but there’s extra shows to see and ride overlays to experience. 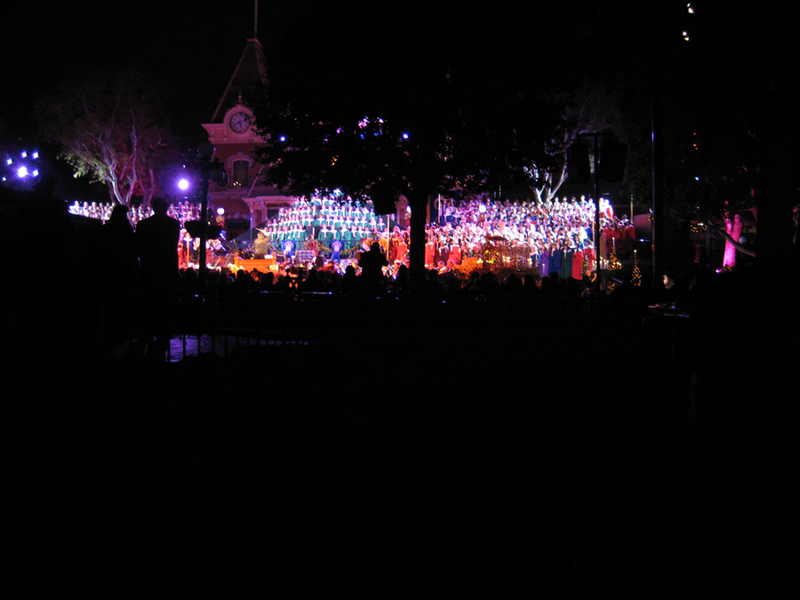 My favorite Christmas time show is the Candlelight Processional—my favorite—usually held the first weekend of December. 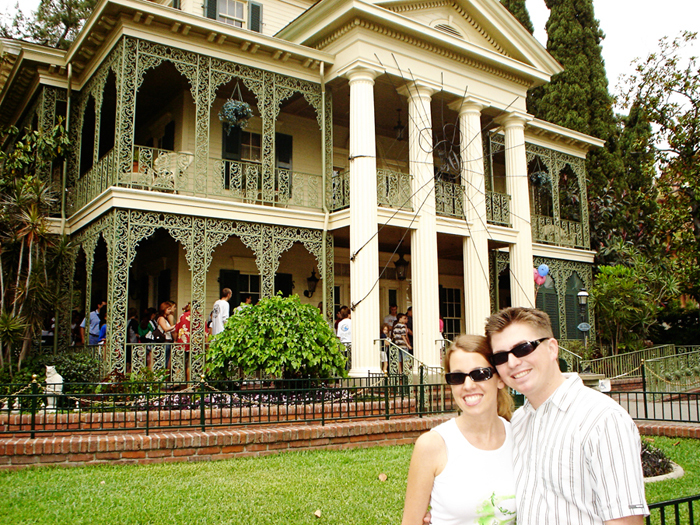 And of course starting in the fall, Haunted Mansion turns into Jack Skellington’s stomping grounds until the new year. As well as Small World decking the halls with bells of holly. Take the train all around the park. 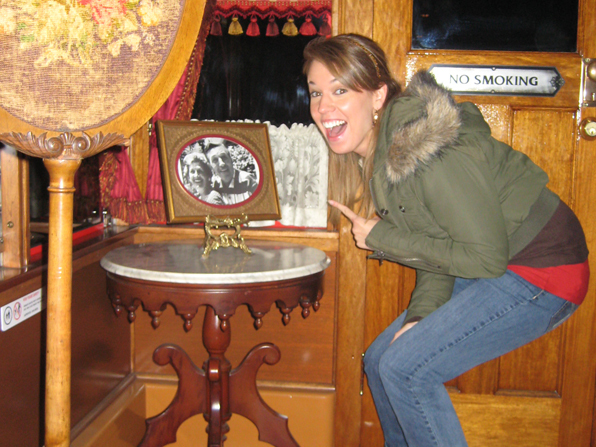 Ask to sit up by the engineer (2 people max) or better yet, get there early enough to reserve a trip in the Lilly Belle—the parlor car decorate by Lillian Disney herself—and the caboose to the C.K. 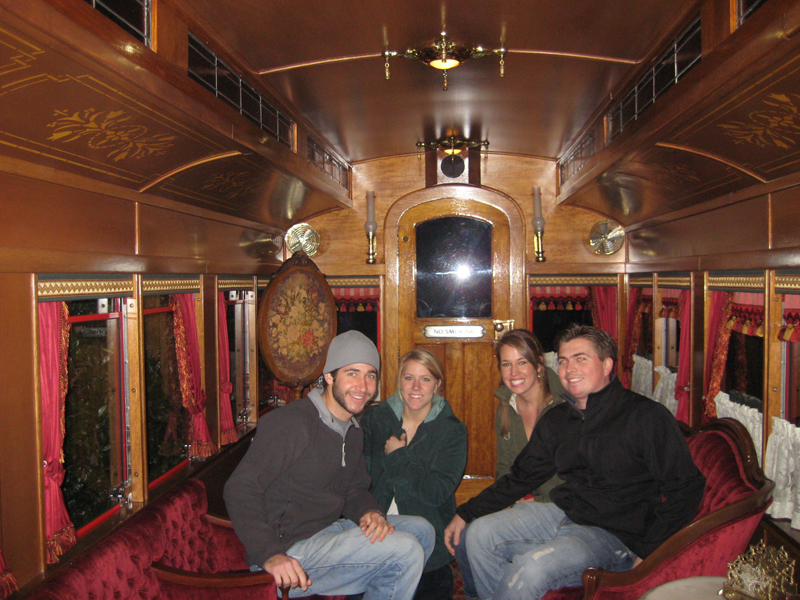 Holiday train. Go on a scavenger hunt. 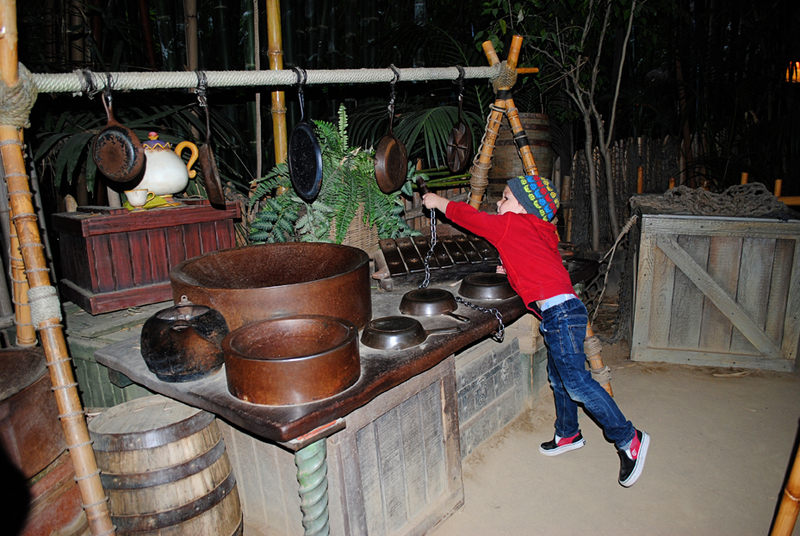 Find Hidden Mickeys (great Hidden Mickey book here) or use the Wishing Stars app. Don’t go on any rides, just enjoy the shows. From the 3D shows to the parades to stage productions like Aladdin, just spending the day at shows can really take up the whole day. 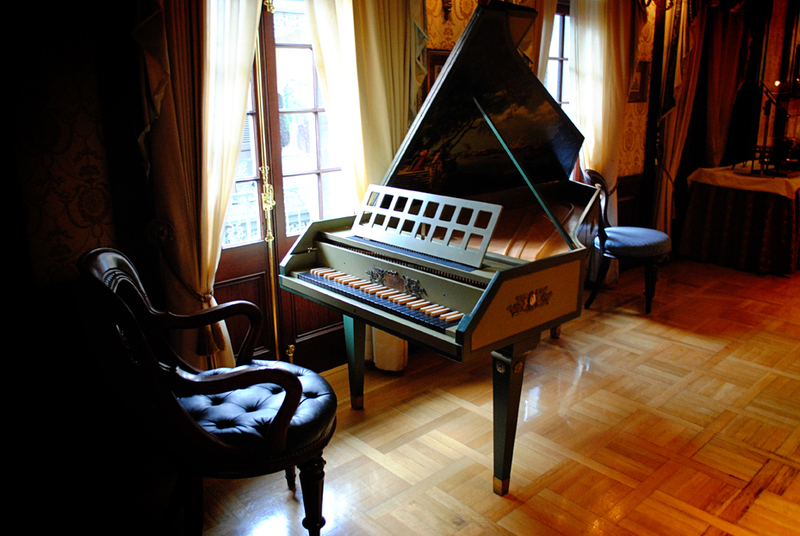 And a great way to enjoy the parks in the summer, away from the crowds and in the air conditioning! 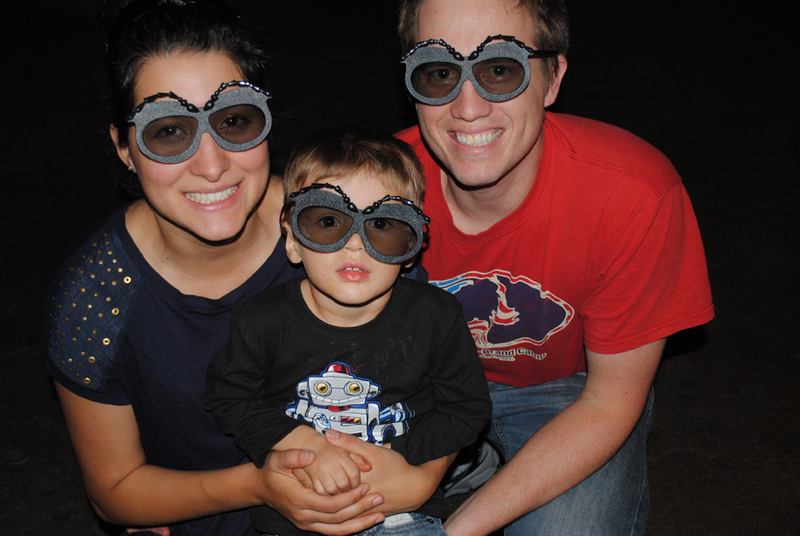 My favorite 3D show is Muppet Vision in California Adventure. But of course my all time favorite show would be the Fantasmic production on the Rivers of America. Favorite by far! Diversify your “ride photos” with different poses and reactions. The sleepers always crack me up. 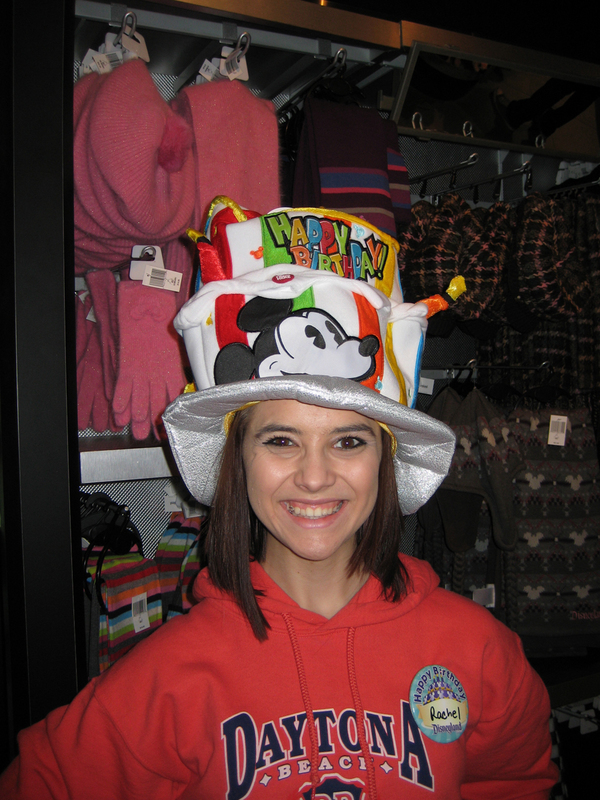 I love celebrating birthdays at Disneyland. 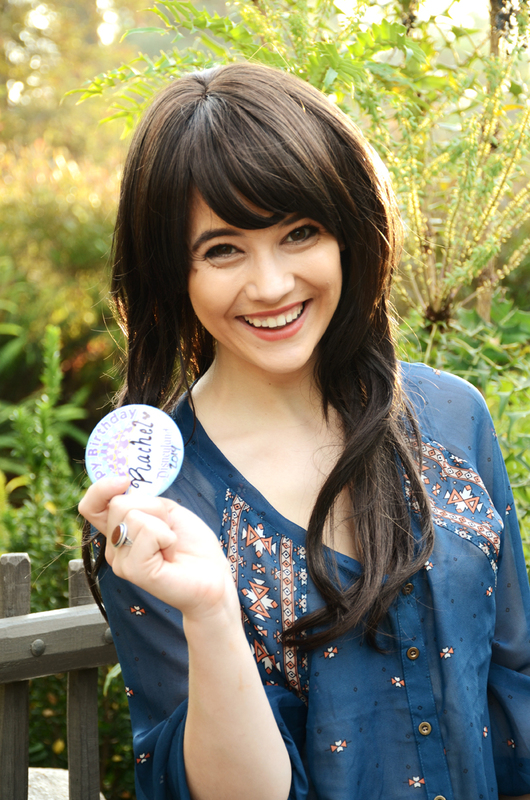 Wearing your birthday pin always gains the affections of all the cast members and ensures that your day will be a happy one. 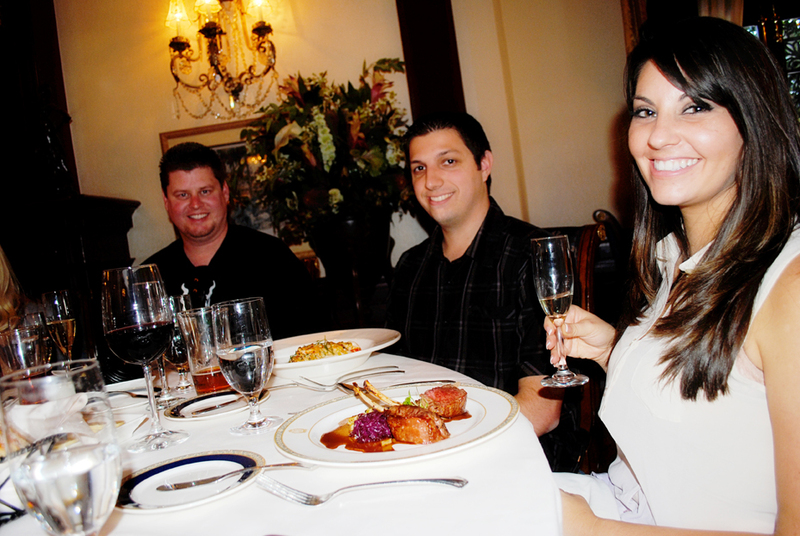 Speaking of food, another fun way to make a few trips feel extra special is to dine in at the nicer restaurants the park offers. 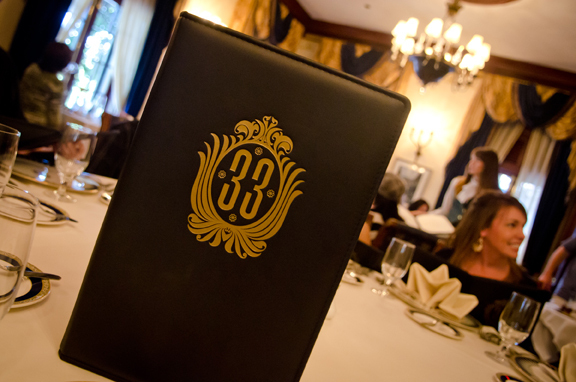 Whether its Blue Bayou, the restaurant within the Pirates of the Caribbean… or its neighbor: Club 33. 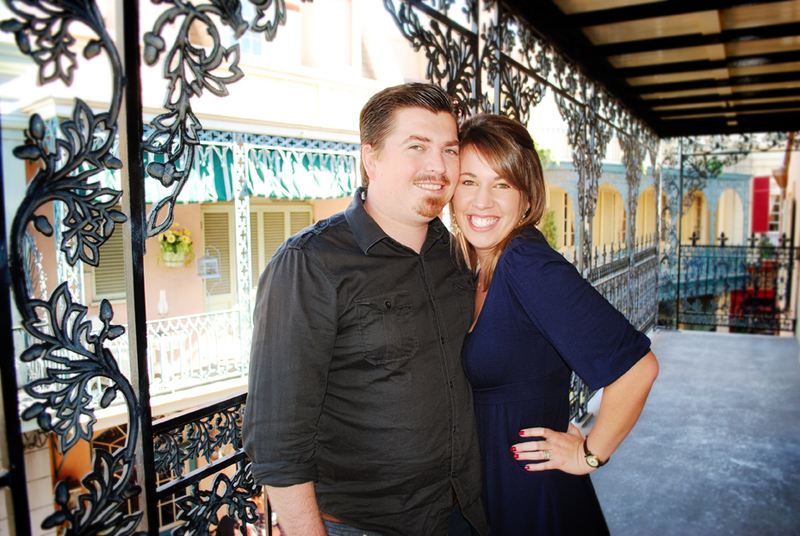 Andy and I have dined at Blue Bayou quite a few times, usually celebrating our anniversaries or during our honeymoon. 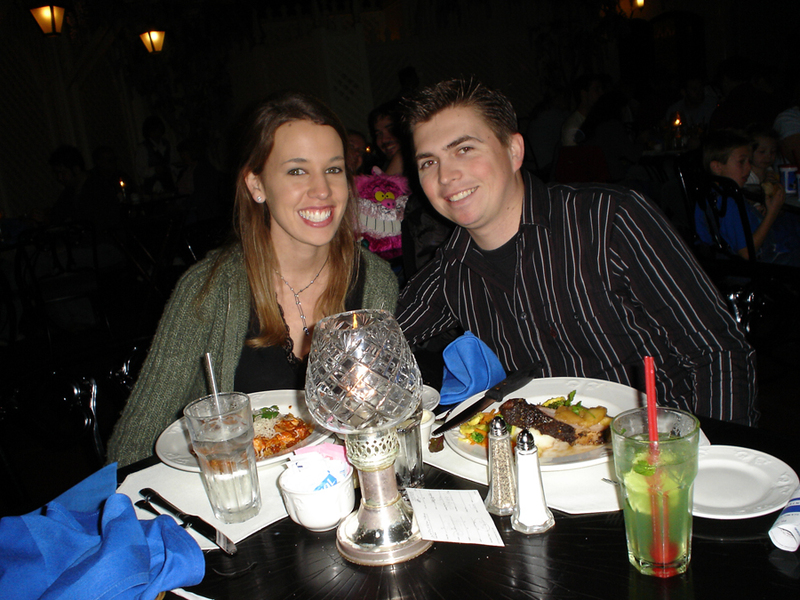 Here’s a photo from our one year “dating anniversary,” 2006. 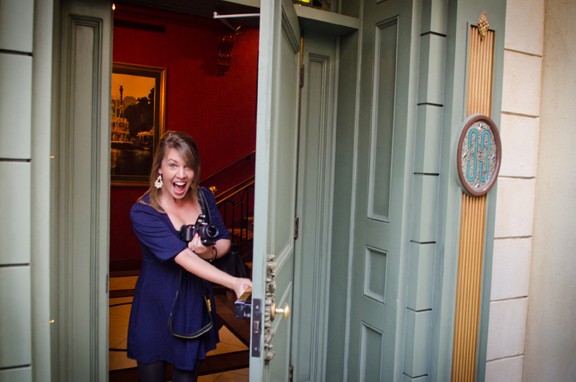 And I can’t believe it’s almost been a year since our first ever experience at Club 33. Read more on that trip here, and a full photo tour here. 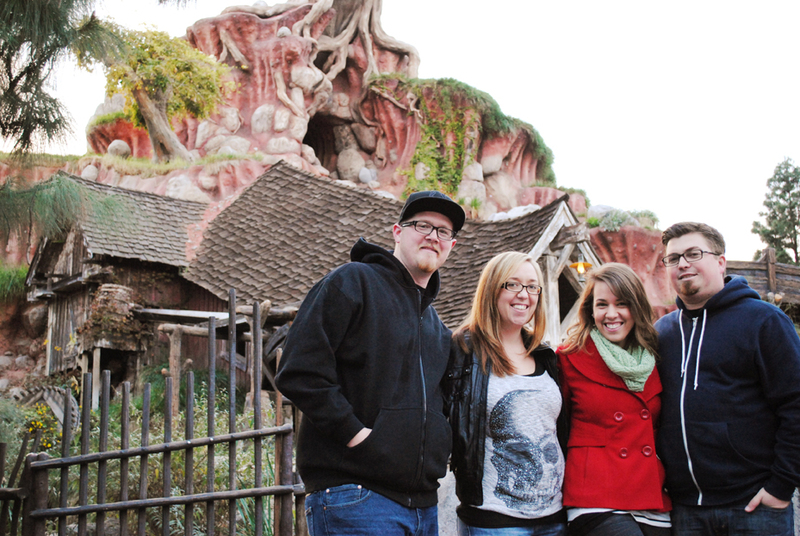 By far, the best way to diversify your trips to Disneyland is to go with different groups—from friends to family. I can’t tell you how many friendships were formed within these park gates… But specifically, go with different ages. From usually going with adults the first half of having a pass… it’s such a different experience (obviously haha) going with kids. You see the park in a whole new eye opening, jaw dropped-in-awe experience. 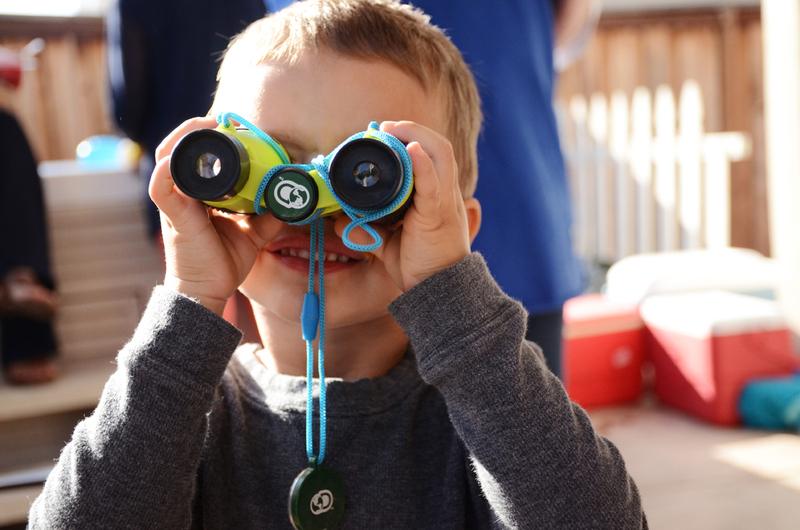 This may seem oh-so-very obvious to most… but it’s only been in the last 5 years that I started going with kids (thanks Eli!). 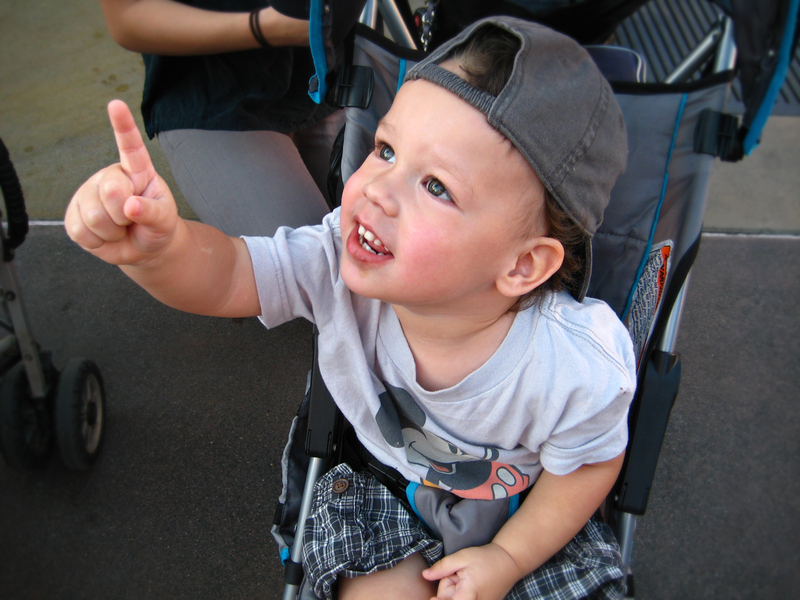 And for this Disney-fanatic, I love sharing the joy and wonder in the parks with these little kiddos. I think my heart grows in size every single trip. Okay, I need to stop this post now even though I can go on and on… plus I’ve made myself cry like 6 times just writing it and going through all these old photos. 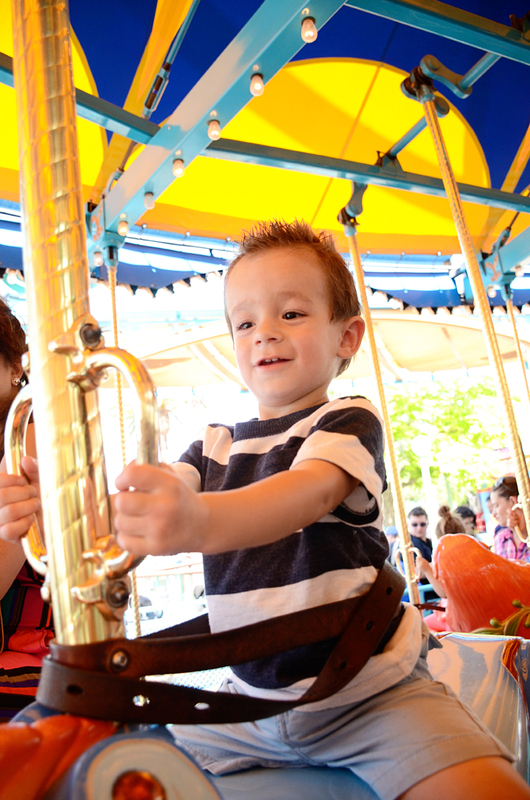 Do you have any special Disneyland adventures to share? Comment below! I only have a few trips left and I want to get it all in! Andy and I have always dreamed of living outside of California, in either the Pacific Northwest or in Colorado… but with my husband’s undying passion for all things BBQ, Texas has now been added to the table. So when I saw this adorable and so very cool illustration of all things Austin, I just had to save it. I may one day need to post this Invisible Creature’s graphic in a someday blog post titled “We Are Moving to Austin!” But until that day I will just admire the many details of this illo, from its colors to its creative use of all things geometric from my office in southern California. Designed for Austin City Limits Music Festival by Invisible Creature, found via Veerle. In July, I posted about our weekend away for Kathleen’s bachelorette party… while at the Renegade Craft Fair I discovered the work of Ann Shen… and I seriously fell in love with her style. Especially this Storybook Alphabet Print that gives a giant nod to Disney without being ” too Disney,” plus it includes so many more storybook characters. Which is totally me, I do after all want a storybook themed baby shower… and I kinda want a baby to justify having to buy this adorable print. But until then, I have saved it in the back of my mind for whenever that day comes. But seriously, check out Ann’s Etsy shop, so many cute cute things. Next on my wish list would be her Once Upon A Time print, notice the theme? When we got married 6 years ago, Pinterest wasn’t a thing and it was just at the beginning of the “wedding blog phenomenon” Okay, wedding blogs totally could have been a thing and I just didn’t have a clue. I also had no sense of style and left wedding planning to my husband, mother, and amazing florist. Anyway, after seeing this post on Green Wedding Shoes, I think this may be what my wedding would look like today. In large part, this wedding’s decor reminds me of my house but in wedding form. They even have a giant [pirate] ship! Oh man, I’m in love… See oodles and oodles of more photos here. I’ve made a few cake stands, but I don’t actually own one myself. I think I may need to add this to my wish list next year… even though it’s not a “stand,” I really like the one toward the end of this Design*Sponge list, the mercury “glass-esque” one (Victorian Cake Dome). 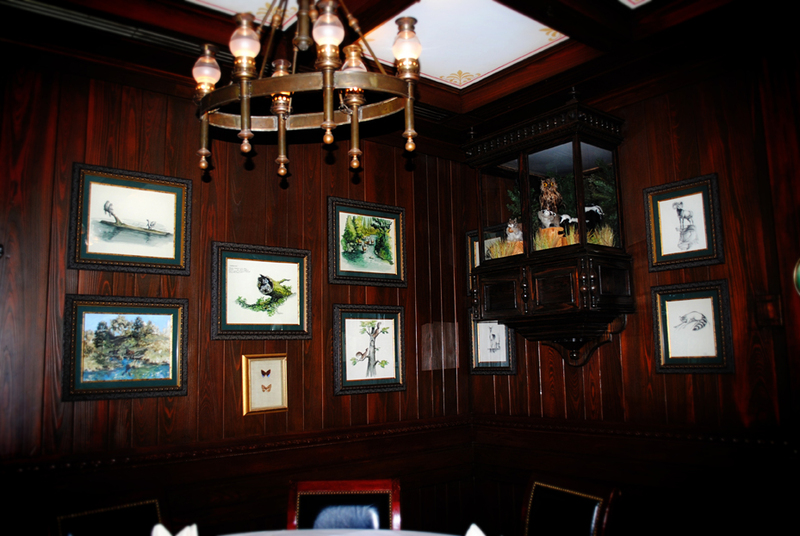 One of the things Walt Disney loved to do was to add little surprises throughout the park that guests could stumble upon. In filmmaking they were known as interstitials, events between the major events. Within the best films, you need occasional pauses in the action to catch your breath. If you remove them, the film would be a chaotic jumble of raw emotions. Disneyland and Walt Disney World were designed with interstitials in mind and that is why they are not a Six Flags style amusement park. 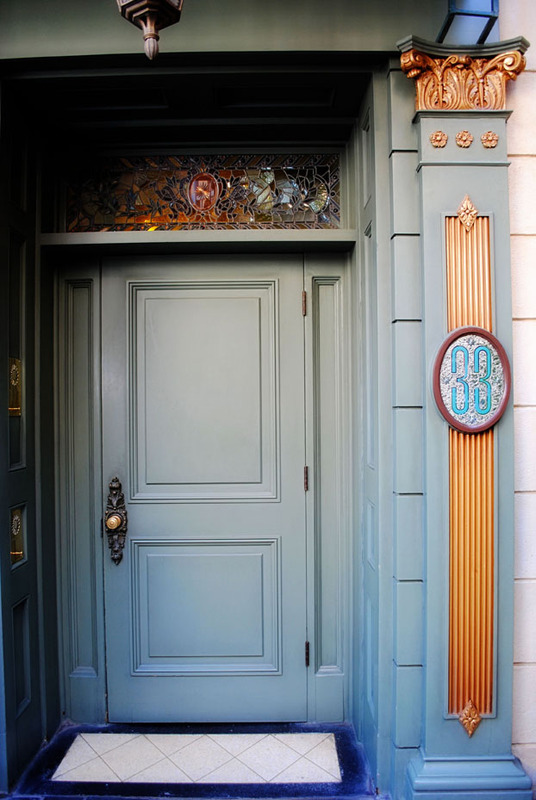 Are you ready for the GRAND tour of Club 33? And I mean grand because there are a ton of photos. Too many actually to even post here. 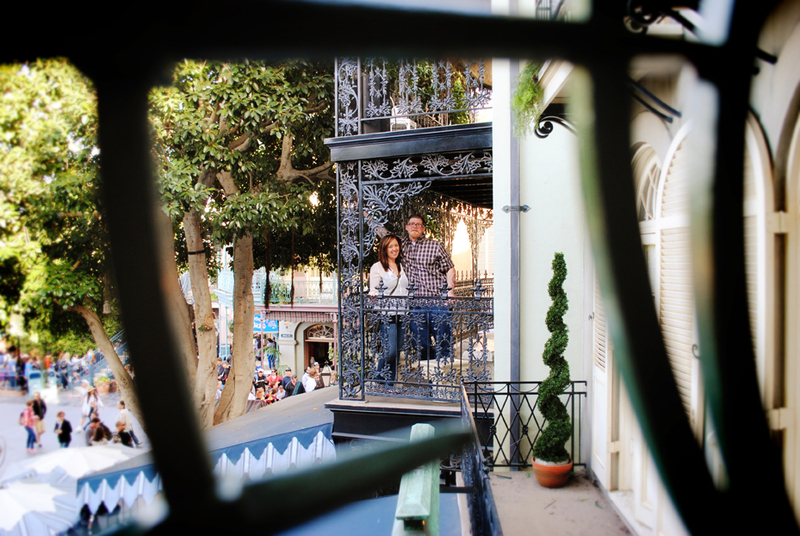 Between me and Mr. Anthony Tran, there were hundreds of photos taken… from the furniture to the walls and beyond the balconies. 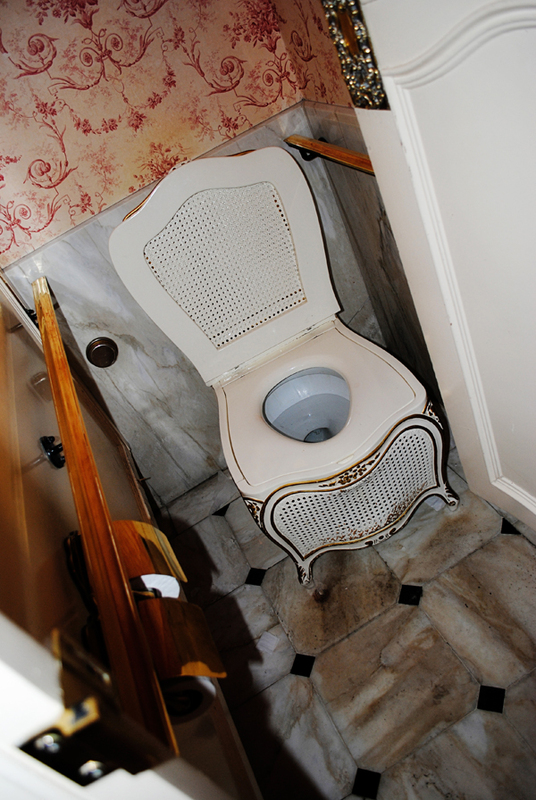 Including the bathroom facilities. If you want the more sensational post about our trip check my first post here… the following post is all about the facts—the whats and where’s that at’s. 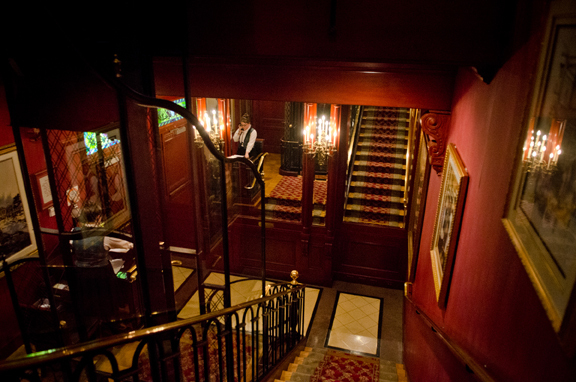 You begin by ringing the doorbell to check in at the front door with the receptionist. 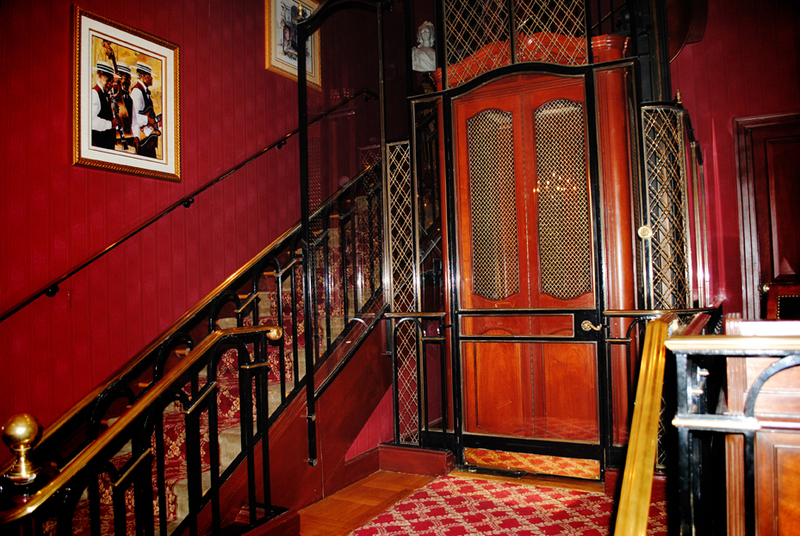 Then the big moment arrives when you get to walk through the emerald painted Club 33 door and the whole party is greeted by the receptionist and a large staircase and a lift (elevator). 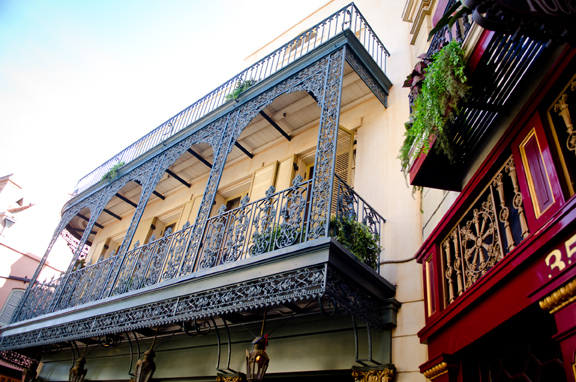 The staircase takes you up and above Royal Street where you then cross over the street below. 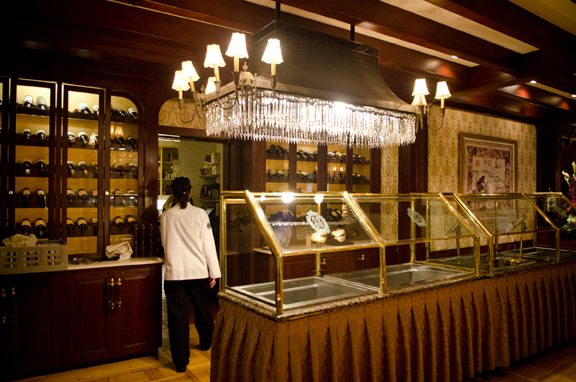 Many people think Club 33 is just above the Blue Bayou restaurant but the buffet area and the main dining room is actually across the way and above the French Market. 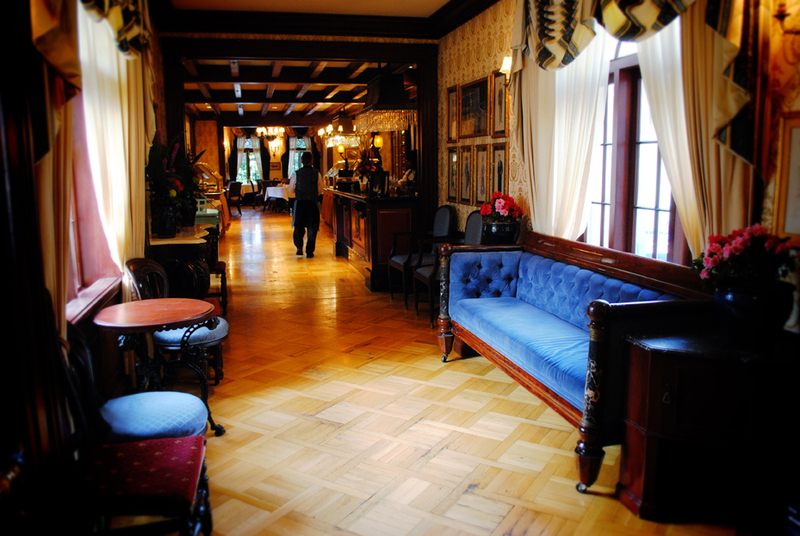 Down this “lounge alley” leads you to the buffet stations and ends at the main dining room. To your right and out of frame would be the top of the staircase and the trophy room. This table is from the movie Mary Poppins and found its home in the Banks home before finding its place here at the Club. 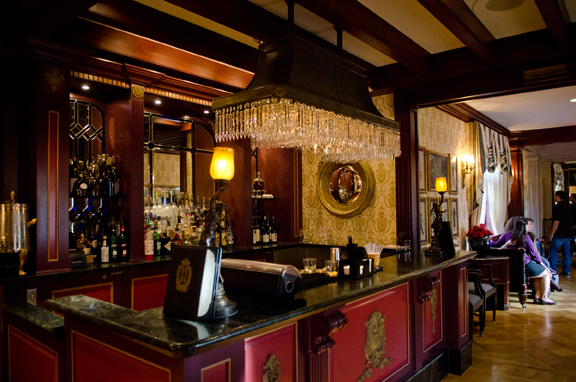 Next up would be the bar, and in the background you can see the couch us girls were sitting at (seen above). We came during the lunch hour so each meal came with a buffet of appetizers. 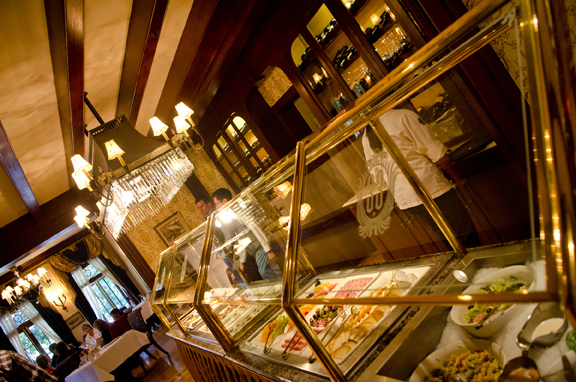 As well as a dessert bar. 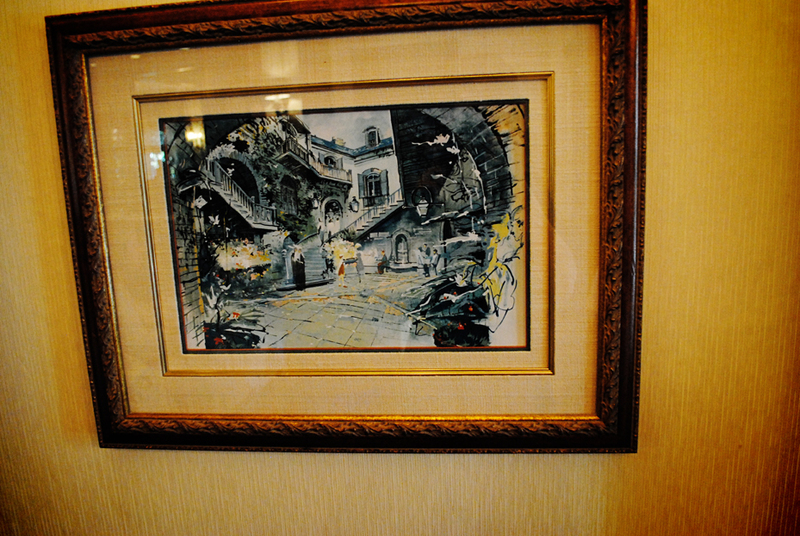 Behind the dessert bar were concept art pieces by Marc Davis for the Pirates of the Caribbean attraction. 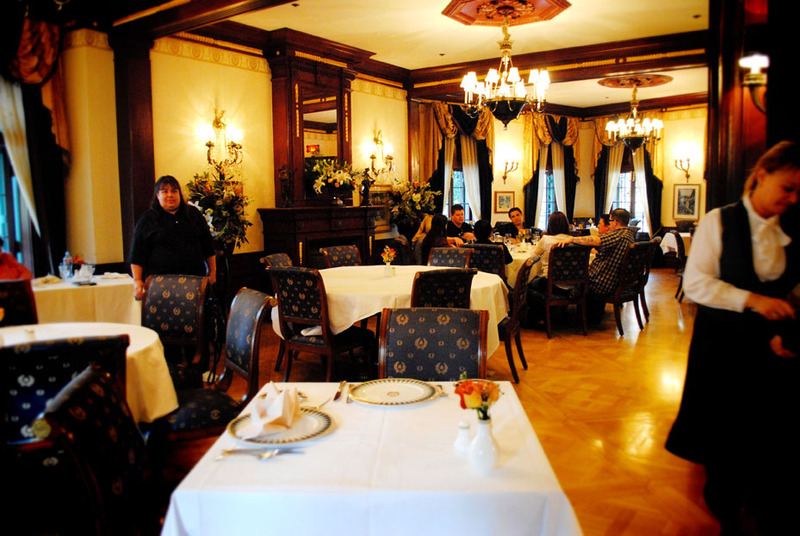 When we first arrived the dining room was full but by the end our group was the only one left. We were definitely making the most of our time there. 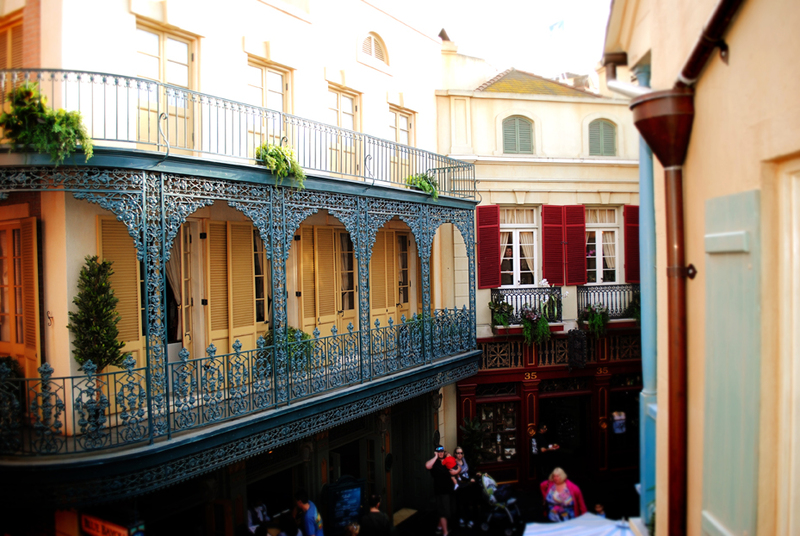 My favorite part of the whole visit was standing out on the balconies above New Orlean’s Square. 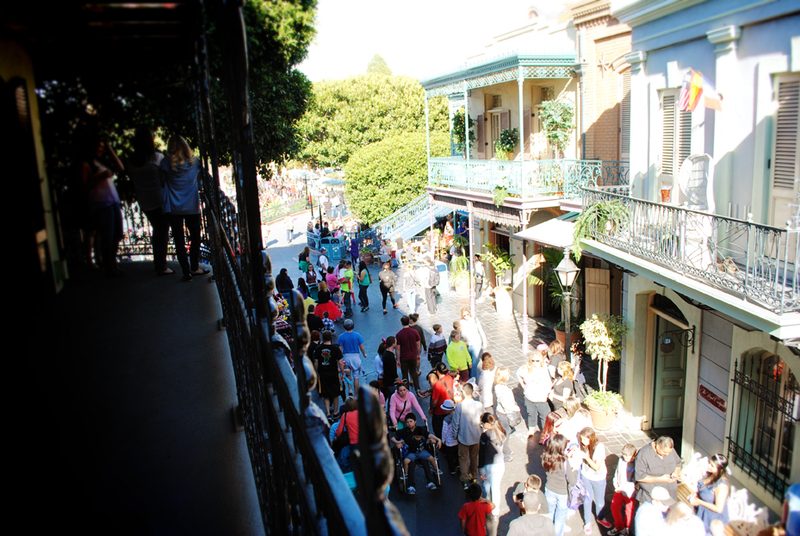 And these few are from the balcony facing toward the Rivers of America and Haunted Mansion. 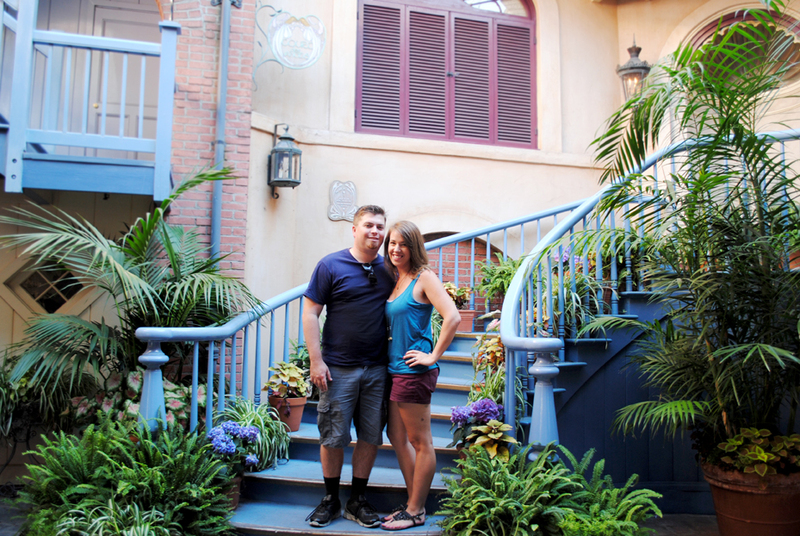 I am so happy Anthony got his photo with my favorite spot of Disneyland, the Courtyard of Angels, in the background! 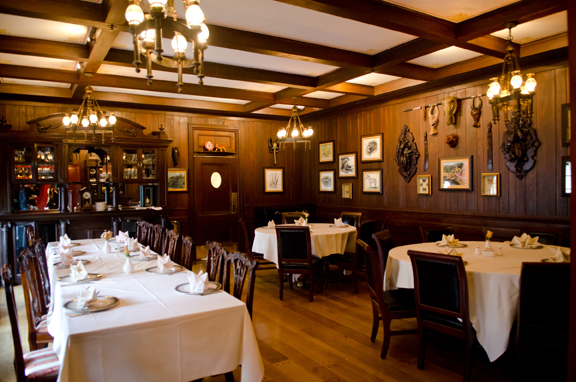 Looking up and above the Blue Bayou restaurant is the Trophy Room, a more informal dining room for the Club. I had to take a photo of the curtains because I want to try to match them for our home office! 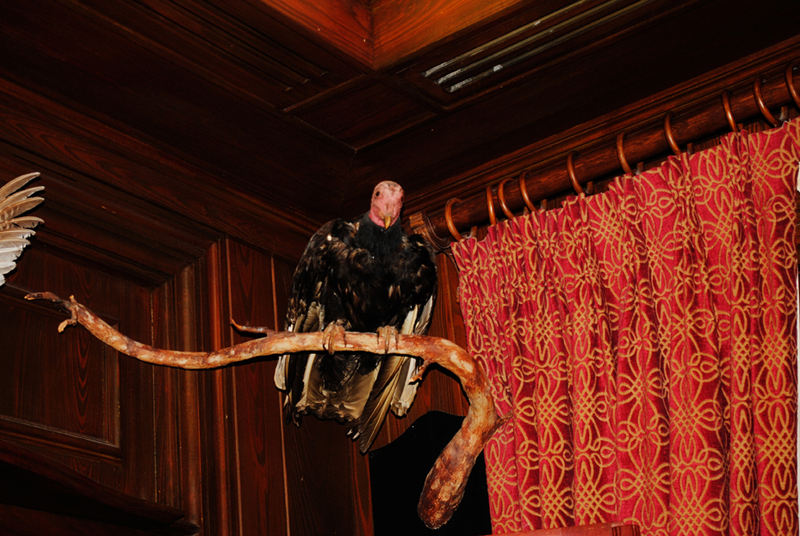 This turkey vulture is an actual audio animatronic that would be voiced by an actor hidden in a sound room. 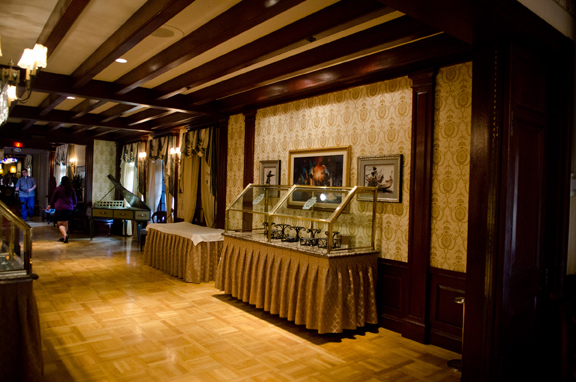 The chandeliers above the tables had hidden microphones that the actor could use to respond to the guests while they dined. All the microphones have since been removed but the vulture still sits above the entrance. 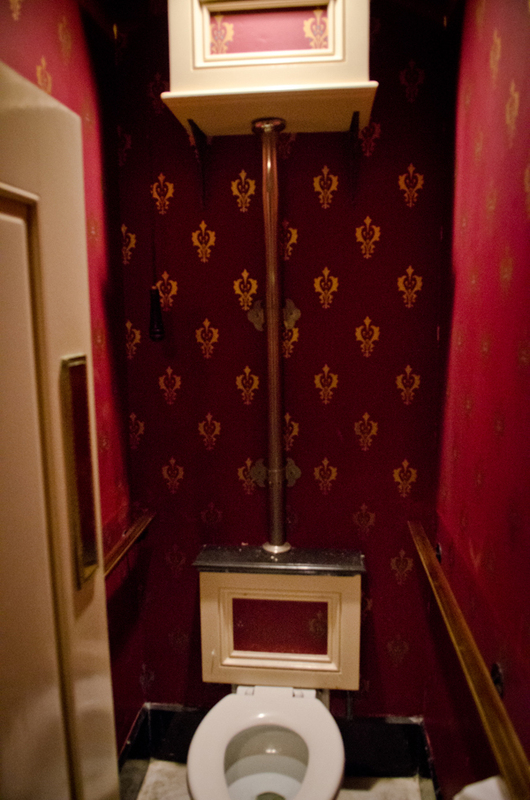 As we near the end of our tour, let’s take a quick glimpse inside the restroom faciltiies, which are almost just as beautiful as the rest of the Club. Starting with of course the Ryman concept art for the Courtyard of Angels that I posted about in January! 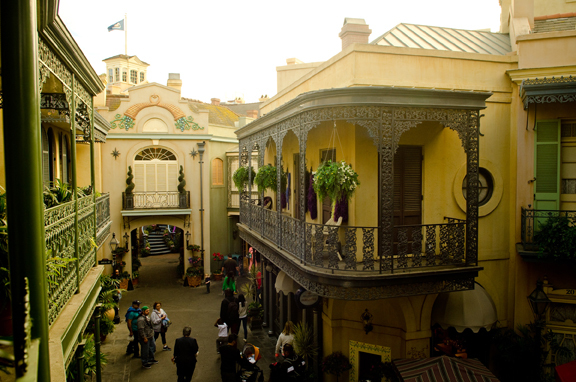 The original entrance to the apartment above Pirates of the Caribbean on Royal Street… before the creation of the dual staircase in front of the attraction. 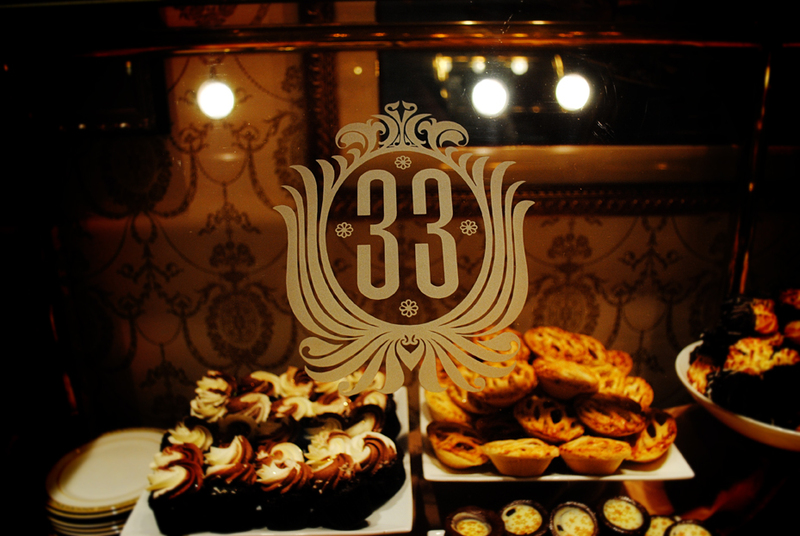 The night before we went, I was looking up random stories about the Club online and found a post by a castmember who finally got her turn to enjoy Club 33. She closed her post with a photo of the back of the door. And I really loved that. 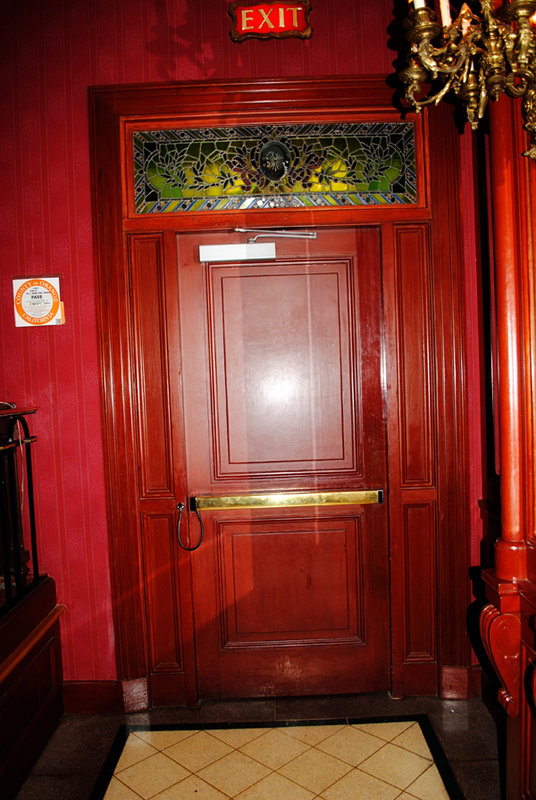 For the rest of my life I will have many more photos from the front of the emerald green door but only these rare photos of the back of the wooden and red door. And thanks Anthony for taking such amazing photos throughout our visit! We all so appreciate it! 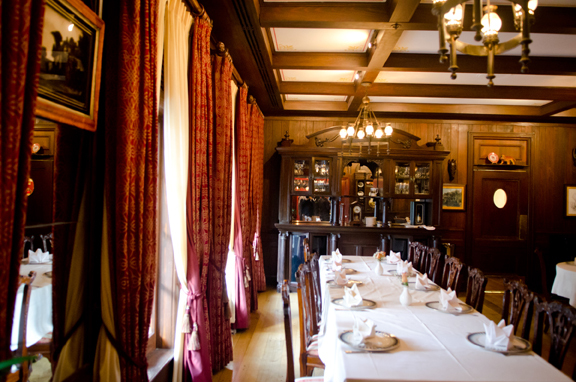 And of course one very last glimpse back… to the right behind the tree is the main dining room where our party of 10 spent 3 hours on our Sunday touring the exclusive Club 33 at the Happiest Place on Earth.